Feb 28 This is a transition day. We begin the day at a State Park campground, one of many places we that we have stayed for one or two nights as we persued our adventure. Tonight will find us in another campground, but this one will be different. Sure it will be a pretty little private park in the mountains, but that is not what will make it different. What will make it different is that we will call it home for the next two months. When we first decided we wanted to experience this lifestyle, we included all the different aspects of the RV life as we planned our adventure. Work camping is something that many RV'ers do, yet far, far more never never experience. I don't know whether to laugh at or feel sorry for, the people who post on the forums about how they would never work camp, yet purport to know all about work camping. How many times have the words they've written, caused people to hesitate or not attempt something? If we stay in our shells how are we ever going to grow to be tree? 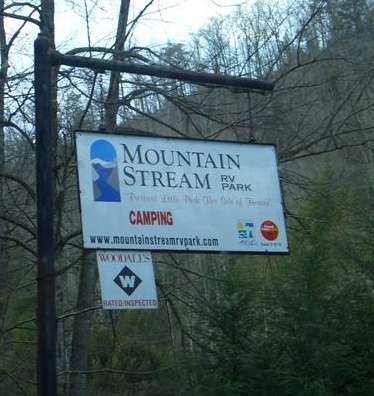 Because of these things and the desire to be of service to others, we committed to volunteer at Mountain Stream RV Park near Marion, NC for the months of March and April. We hope that over the next 8 1/2 weeks to give you a glimpse into the daily life we will be living. 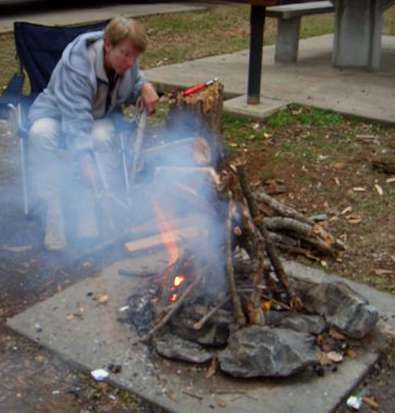 There may be no wrong turns leading to non-existent campgrounds for a while, but you can bet that we will experience every aspect of the work camper life and on these pages, you will too. Our drive from Spartanburg SC to Asheville NC on I-26 was uneventful. Traffic was light and the road was good, however as we traveled east on I-40 from Asheville we encountered a steep downgade. This one was not like the monster downgrades out west, what makes it different was how curvy it was. It's like they took an existing road and used that right of way it to make an interstate. Probably saved North Carolina some money, but how many people have to be maimed or killed because of these poorly design highways. I know I get off on this tangent every once in a while, but it really gets my goat. Why do we tolerate such incomptencey from our government? Okay, okay, off my soapbox. Note that the sign in the picture to the right is NOT of I-40. It was on NC-80, the state highway that goes up the mountain past the RV park for several miles to the Blue Ridge Parkway and beyond, it just doesn't get much prettier than this! It was late afternoon when we pulled into Mountain Stream RV Park and within minutes of arriving, we felt like we had known the owners, Ron & Becky Johnston for all of our lives. Every once in a while God works a little magic in our lives. This place has angel dust everywhere! It was shirt sleeve weather as I grilled turkey bugers to perfection. It's no secret, rub extra virgin olive oil on both sides, grind on some salt and pepper and grill. I also grill the buns which are whole wheat english muffins. 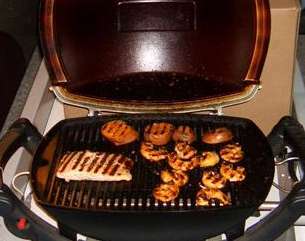 As with the burgers, they are coated with EVVO and grilled till lightly toasted. Takes a little experimentation to get the timing down right, once it's nailed you're talking mind blowing good burgers. (We also do both the ground sirlon burgers and the buffalo burger the same way.) Served with southwestern beans, saute'd green & yellow baby squash plus salad, it made for the perfect meal to mark the next phase of our next adventure. Then there is always dessert. Tonight it was chocolate chip cookies and warm vanilla flavored milk. I'm gonn'a sleep like a log!!!! But what will tomorrow bring? Feb 27 Man-o-man, did we ever sleep in this morning. We (Linda) had gotten down the second comforter last night and used it as a topper on the bed. This was the coldest night since we began our adventure ,but we never noticed how cold it was, though there might have been a higher snuggle factor than usual last night. Normally when we stay at a Walmart we leave early in the morning. Not today. But the joke was on us, because when we finally did pull out , every one else who had spent the night in our little corner of the Greer, SC Walmart was still there!!! This is going to be a short drive day. Our plan, and based on yesterdays experience it is only a plan, is to drive the few miles to Spartanburg and stay at Croft State Park for the night, giving us some rest, catch up and baking time We were really ready this time with the route to the park, or so we thought. We had it programed into our GPS, plotted on Streets and Trips, printed off Yahoo! maps and marked on the road map. All this meant we had absolutely no problem until we turned onto the road that went to the Park. As soon as we turned off the state highway onto the narrow country road we see a big sign, "Bridge out, Road ends 1000 feet" 38 feet of RV, 4 feet of tow bar and 17 feet of Explorer come to a sudden stop in the middle of the road. We are on a very narrow country road - what would you do? Ahead there is a very small pull-out. We pull off the road, or rather I should say we pull the coach off the road, the back half of the Explorer remains on the road. Now what to do? We did the only thing we could, Linda told Bob to walk down the the road and see what was or wasn't up ahead. About 5 minutes later Bob returned with the good news that the missing bridge was 'after' the turnoff to the state park. Of course this begs the question as to why they couldn't have had a sign saying the road was open to the state park. Jeez, no wonder these people lost the the Civil War. The road back to the campground seems to go on forever, but finally you arrive at the campground(s). There are two of them, one to the right and one to the left. We opt for the one to the right. As we start to turn in I begin to wonder if the campground was designed for anything bigger than a Model T Ford. None the less we plunge onward. And plunge it is, as the road takes an abrupt turn to the right and descends at a precipitous rate. Undaunted, we intrepid adventurers travel on. Off to the right we notice a pull thru, or what apparently passes for a South Carolina pull thru. Getting anything larger than a Honda, let alone any kind of RV, into that sight would take a miracle!!! Half way around and we haven't seen a site that would begin to let us park the coach. On the far side we pass 4 or 5 sites we could get into, but by now we are thinking about the other camping loop. So off we go to explore those sites, or so we thought. Once again demonstrating the brilliant South Carolinian mind at work, it isn't till after you are on the road to the second campground that you see the large pile of gravel that blocks the entrance. Why they couldn't have put a sign up letting people know the loop was closed is beyond me (apparently it is also beyond the intelligence of the people responsible for this park). Well look at the good side of it. Everybody says that if you tow a toad, sometime you're going to find yourself in a spot where you have no choice but to unhitch the toad to get out. We now count ourselves among the select group that has to unhitch the toad and turn around the coach!!!! Another feather (??) in our hat. So back to the first loop we go and park deep within the piney forest where no Motosat will ever find the Satellite. Later a 5th wheel came in and parked in the only open to the south site. A little later we saw a MotoSat being deployed on its roof. Only took it about a half hour to find the satellite, but by then I've concluded that nothing is easy as far as RV'ing in South Carolina is concerned. In the late afternoon we went into Spartanburg to do some shopping. True to South Carolina standards, the street the Sam's Club was on did not show on any map we had, nor the GPS or Streets and Trips. Found it by going to a WalMart and asking the greeter where the Sam's Club was. Maybe we're finally figuring out how these people think. As a personal aside, I spent almost 15 years working for a South Carolina Company and other than my occasional trips back to the Greenville area, I enjoyed very much working for them as the people were the absolutely greatest. Linda just made a comment about my nose growing to extraordinary lengths, ha, ha. Returning to the coach we put away our purchases. One thing we we are used to buying out west is 3 lbs bags of bittersweet chocolate chips. That's what makes the cookies and brownies we make so awesome. Unfortunately the concept of bittersweet chocolate seems about as foreign as unsweetened tea here in the south. We may have to have some bittersweet chocolate chips shipped in from California if we're going to continue to make the world's best chocolate desserts!!!!! Later we made a roaring fire, shelled some peanuts and relaxed as day turned to night this late February evening. Dinner was a variation of one of Bob's specialties: baked salmon in leek sauce, accompanied by brown rice, broccoli & parmesan cheese with a tossed salad. 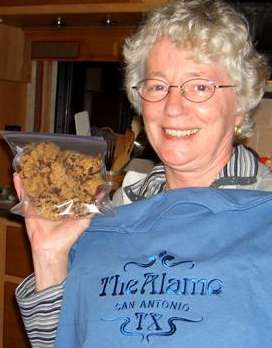 Later Linda baked her worlds best chocolate chip cookies, part of the secret is the bittersweet chocolate chips, whole wheat flour and chocolate pudding mix. Just so you know, perfection comes from hours of experimentation and constant tweaking of what is already an awesome recipe. Served with warm milk it recalls memories of childhood that are incomparable. As I've said so many times, we love the life we live. Feb 26 Sunday morning, so we have another opportunity to check out a mega church. Our plans were to spend some time in Marietta, Georgia today and as luck would have it, there was a mega church almost literally across the street from where we were going. 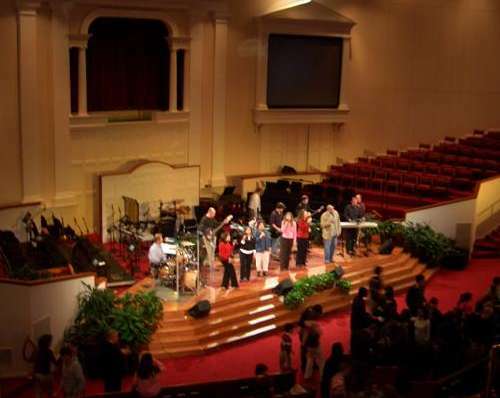 The church was Roswell Street Baptist and it held two surprises. One was related to clothing, the second to singing. 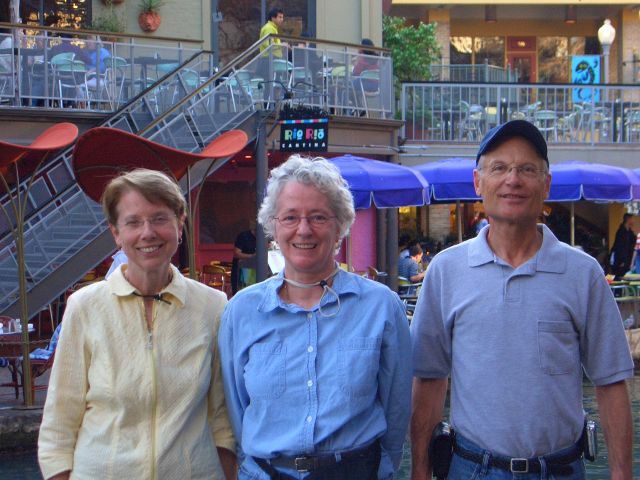 Being Californian's we are used to casual church dress being blue jeans and sneakers. This has been the standard in the contemporary services at the mega churches we have visited across the country. Today we found out, casual dress at a contemporary service in the old south means sport coat and tie instead of the usual suit and tie. We quickly decided we would sit up in the balcony and low and behold, there were a number of other more casually dressed folks up there. The second surprise was the voice of the lead singer. He had the most beautiful, melodious voice we have ever heard at a contemporary service. There was the normal praise band, but on the last two songs this one cut loose with some mind blowing acoustical guitar work. To sum it up, a pleasant time was had by all. Next we drove one block over to Washington Street and visited the Marietta National Cemetery. The origin of this cemetery was in the deaths of General Sherman's troops as he march on Atlanta in 1864. One of those deaths was an ancestor of Bob's. The grave site is on a hillside under a large tree, a beautiful final resting place for a farm boy from Ohio who died a horrible death from dysentery just a couple of months after joining his brother in the 3rd Ohio Battery. Looking at the thousands of white stones here and remembering the thousands in Andersonville, you realize the Civil War personally touched almost every family in the country at that time. Once again we were reminded that, truly, "War is hell". We "broke camp" and hit the road once again. As we drove northeast on I-85 we had our first oppotunity to stop at a Flying J for fuel. Now I know why people speak so highly of them on the discussion boards. Separate easy acess pumps for RV's, dump station and propane, nice!! They way the pumps were set up we filled the diesel tank from both sides at once, also another first for us. All this and their prices were the lowest of any of the stations at this exit. 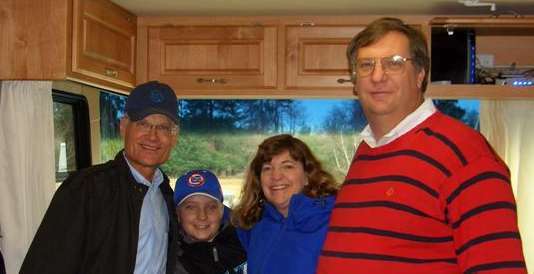 Our tentative plan was to stay in an RV park just north of Greenville and possibly spend time with an old boss of Bob's. Events transpired to change our plans. 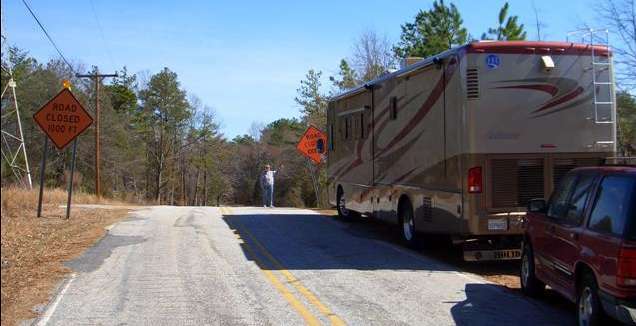 First we left the Atlanta area much later than we planned, second, Atlanta traffic was much heavier than we anticipated and third, we couldn't find the RV park we had planned to stay at. Trying to find the RV park is a study of life on the road in a microcosm. We had tried to find a park close to Greenville as that is where we wanted to stay. 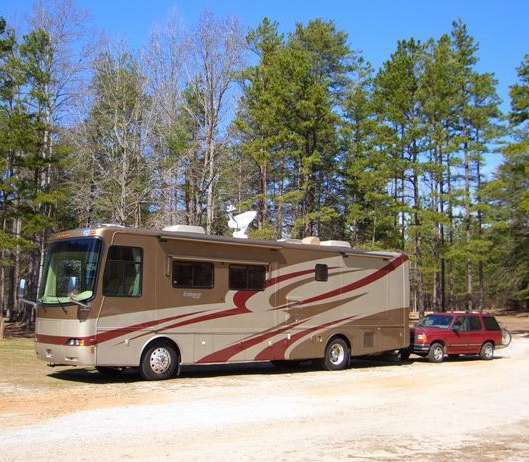 Searching the books and the web, we finally decided on Flowermill RV park just north of Greenville. They have a nice website, but then I think we have a nice website, but that doesn't mean it provides useful information to anyone. 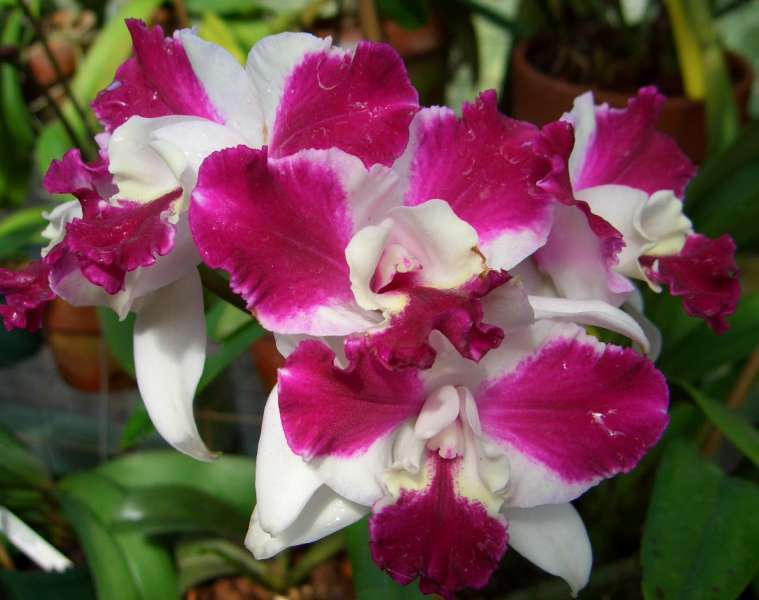 Unfortunately, the Flowermill website and reality are two disparate realities. First off, once you leave the main highway, the country roads to the park are ridiculously narrow. We hit a number of small branches along the road on the way in. The website gives the address, but doesn't suggest the best way to drive to the park. We drove in following the best road we could find, then found out the road the park was supposed to be on didn't intersect with the road we were on. We stopped in a church parking lot where a few heated words were exchanged between the driver and the navigator. Deciding to turn around we drove back, turning at what we thought was the right road. The sign didn't match what the map said, but sometimes you have to put up or shut up. We decided to put up and turned onto the road we thought was correct. Rounding a sharp turn we saw some RV's parked to the left. The road leading to the RV's, if it could be called a road, was incredible steep and there was no sign visible to identify whether it was the RV park we were looking for or not. We passed it by and with a little luck and a lot of wandering, plus dodging more branches, made it back to the main highway. We may be dumb sometimes, but we're not stupid. We decided this was not the place nor the time for us and drove on towards Spartanburg, SC. Just a few miles down the road we happened upon a Walmart, noticed an RV already parked at the outer edge of the lot, so we pulled in and parked for the night. 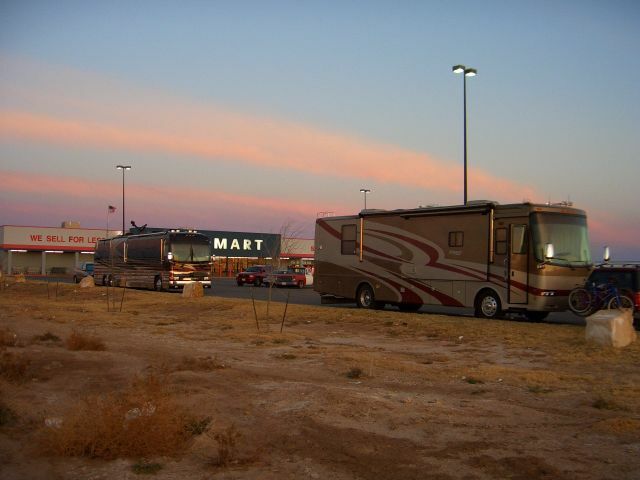 Of course we, as always, spent more money shopping at the Walmart store than we would have at an RV park, but what the heck, at least we could find the place. It was so cold, we opted for hot soup and quesadillas for dinner then cookies with hot Torini raspberry flavored milk for dessert. Our driving may not always be the best, but you can never fault our cooking! Today was also special for someone else, so we make a HAPPY 7th BIRTHDAY WISH to our Grandson Zach!!!!!!! Feb 25 Woke up to to a slow, steady rain this morning. This is one of those days you just want to sit in the RV park all day and do all the inside chores that seem to pile up, since your having too much fun in life to keep up with them. However, one of my things is, we try our darndest to drive through big cities on weekends when the traffic is lighter. With Atlanta and its legendary traffic looming to the north plus the desire to visit another of Linda's nephews while here, it was out into the rain to get ready to pull out. We disconnected the water and electric and connected the Explorer. I have to say, I really love how easy it is to hook and unhook our Blue Ox Alexius tow bar and SMI Stay-in-Play toad brake. The non functioning curbside slide motor finally caught up to me though. With all the boys coming last night, I had hand cranked it out to give us more room in the coach. Now, in the rain, I was going to have to crank it back in. I almost made it too!. Most of the time I was under the slide as as I ratcheted it back in and all the water trapped on the slide topper flowed off the end, but (there's always a but), with about three inches of travel left before it was closed, the water started falling off the front. Now the slide is probably 15 feet long, so why is the only spot the water runs off the topper exactly above where I am kneeling to crank in the slide!!! Our first stop today is at the air museum at Warner Robbins where we were meeting Linda's nephew and his three boys. He told us he trys to take the boys somewhere on Saturdays to give his wife time alone, her break for the week so to speak. Because of the rain and time limits we had, he drove us around the base for a quick tour, then as he and the boys went into the museum, we turned northward toward Atlanta. 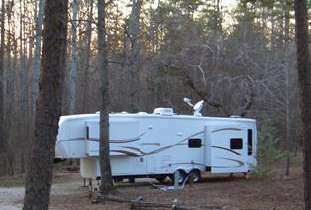 We had picked an RV park in Norcross just off I-85, northeast of downtown, to stay at. This meant either driving through downtown Atlanta or taking I-285 around the east side of town. I opted for the longer I-285 route due to the heavy rain that was falling. The rain slowed traffic on I-285 so that it was going just a little over the 55 mph speed limit making for a more comfortable drive, even with the rain. 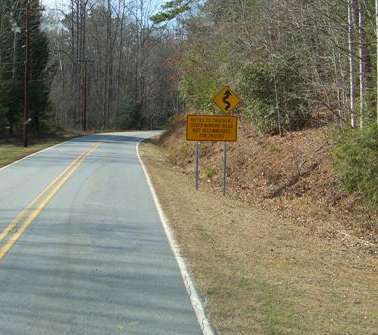 Upon entering Georgia, I had quickly learned that speed limits are merely numbers on signs in Georgia and have nothing to do with how fast you drive, which appears to be limited only by how fast your car or truck can go. It's like everybody is auditioning to be a stunt car driver for "Dukes of Hazard". As we arrived at Jones RV park the weather finally started to co-operate as the rain turned to a light mist. Quickly setting up, we headed out to visit another of Linda's nephews. We had a wonderful time visiting with him and his 17 month old son. We thought the three boys were active! He was a non-stop perpetual motion machine! We had a fantastic meal at Pasta Bella in Austell, Georgia. Italian food done the right way - tons of garlic!!!!! Linda got to see some old family items she hadn't seen in years and then it was time to head for home. A bowl of ice cream topped with nuts capped what was both a funtastic and fantastic day for Linda. The life we live! Feb 24 Vacation mode again today, but because of two very special places, Andersonville National Historical Park and Plains, Georgia. After a quick breakfast of oatmeal and raspberries, we drove over to Andersonville which was the site of the famous Civil War prison camp. One of the first things we did was attend the movie about Andersonville prison in the visitor center theater. 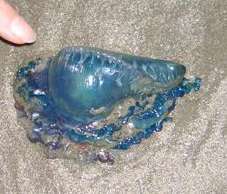 To say that it was moving would be a colossal understatement. When it ended, not a single person in the room said a word or got up to leave until after all the credits had run. 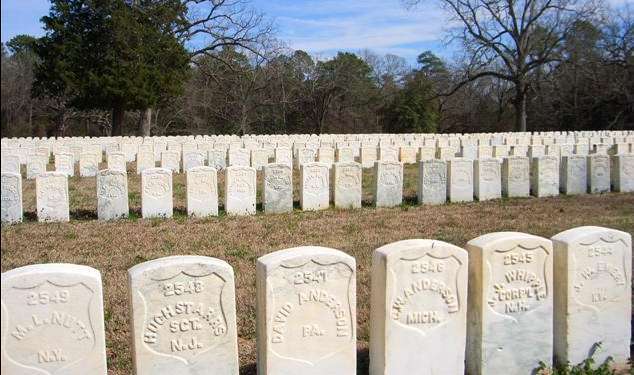 It hit home that no one at Andersonville, whether northern prisoner or southern guard suffered less than anyone else. It was incredible to learn that while nearly 13,000 of the 43,000 prisoners died while in captivity, the death rate among the guards was essentially the same as for the prisoners! It is surely true, "War is hell." Later we slowly toured the prison site, trying, but failing to visualize the scenes of unbelievable suffering and unimaginable horror that took place, not only on this ground, but in all the prisons, both northern and southern, during the Civil War. The emotion we felt as we stood before Povidence Spring was hard to comprehend. One of the many tragedies of the prison camp was that there wasn't enough water to even begin supplying the the needs of the tens of thousands of prisoners. Then during a violent thunderstorm, a spring started flowing out the side of the hill inside the prison walls. A spring that still strongly flows more than 140 years later. Whether the hand of providence was involved or not, it was truly a miracle that thousands of lives that would have been lost were saved by the water from this spring. 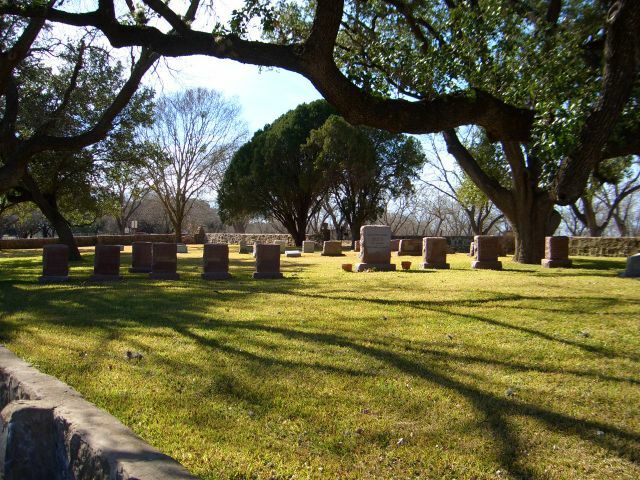 Later we ate our turkey wraps under some huge trees, just yards from the prison cemetery where those that ceased to suffer lie interred in silent row after row of white stones. To visit the cemetery is to feel the sadness this place exudes. The museum and visitors center is a memorial to all American soldiers who were imprisoned during the different wars our country has fought. From Revolutionary War British prison ship through Japanese Bataan Death March to the Hanoi Hilton and the wars in the middle east, the history of the American prisoner of war is told. 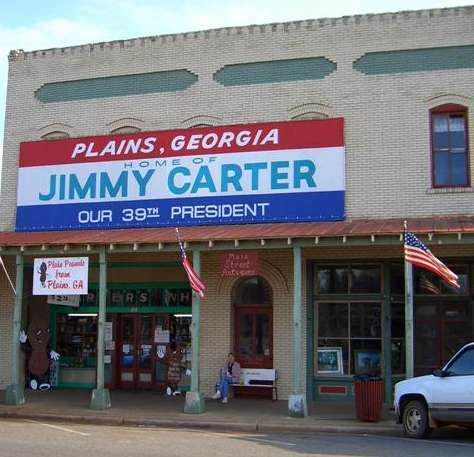 We also wanted to spend time in the town of Andersonville, but were not able to because we were also planning on going to Plains, Georgia to visit the President Carter National Historical Site. We had spent so much time at the Andersonville prison that we we needed to hurry to Plains before the President Carter visitor center closed for the day. The drive from Andersonville to Plains took us through Americus. The downtown area of Americus has many wonderful old commercial buildings. The Windsor Hotel has to be one of the the, if not the, most beautiful buildings we have seen during our adventure. A giant brick building with towers and turrets, pictures just can't do it justice. Entering Plains you see the red peanut trailers parked everywhere. The peanut processing plants are also easily recognizable. Plains is a very small town, with the old commercial area that we always saw on TV being about a half block long with the train tracks running in front of it. We spent a good deal of time touring the President Carter visitor center which is in the old Plains school building. It is very informative, plus the movie they show is excellent. As I walked the halls, I could imagine a young Jimmy Carter doing the same things we all did when we were that age. As I spent time in Plains, I began to see how the core values of honesty, integrity and compassion could be formed growing up and living in a town like this. A visit to Plains would not be complete without buying some peanuts, so we went "downtown" and bought some in the shell raw peanuts we can roast ourselves and also some fried peanuts (shelled peanuts fried in peanut oil). By now it was almost 5 o'clock so we decided to drive past the Carter's house which is on the south side of town before heading back to the campground. Somehow we missed it and had to turn around. As we drove back towards the house we saw a man and woman out for an evening walk. It was President and Mrs. Carter!!!! 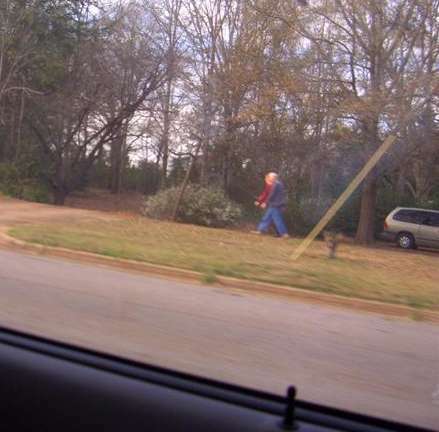 Of course, it was only as we were passing them that we recognized who it was, so we turned around to look again. Trailing the Carters by about 30 feet were two young men we took to be secret service agents and on the street was a very large black SUV, again with young men in it. We realized it was a secret service vehicle when it put on its flashing blue lights to make a car move that was stopped near the path the Carters were taking. Linda managed to get several photos of their backs and I got a small wave from the President as we drove past. This is where they live and they take an evening walk, just like Linda and I do. They are just ordinary people who have been able to accomplish extraordinary things during their lives. Later as we drov e back to the RV park we wondered what the odds were of us driving past the President's home at the same same time he and his wife were taking a walk. Back at our home, we wolfed down chicken burgers and then had a visit from Linda's nephew and his family. He's in the Air Force Reserve and was called up to active duty for a temporary three month assignment which has turned into a two year assignment. While the four adults visited, the three boys, aged 9, 6 & 4 explored every square in of the coach. It was so much fun watching them and remembering our own grandchildren. After a day like this there is nothing better than chocolate chip cookies and warm milk to send us off to the land of sweet dreams. Feb 23 Caesar may have crossed the Rubicon, but today we crossed Alabama. With a Walmart overnight, we were up early and on the road heading east. The rain of yesterday had ceased, but fortunately the clouds that carried that rain still remained. So, as we headed eastward in the early morning those clouds now served as natures perfect sunglasses making for a pleasant drive as we faced what would have otherwise been the rising sun. Almost before we knew it, we were passing by Meridian Mississippi and seeing the welcome to Alabama sign. Wanting to get back to our normal way of traveling we exited I-20 and headed east on US-80 which we followed across western AL to Montgomery. Most of US-80 is a divided four lane highway. The drive was peaceful and relaxing. We had a moment of humor between Selma and Montgomery when we had to stop for a herd of cattle who found the lush green grass in the median more to their liking than the grass in the field along the road. We really felt for the poor fellow trying to chase the cows off the road. For some reason, we just weren't finding anything in Alabama along our route to stop and see. The one less than memorable thing we did encounter was the worst section of road we have traveled to date. I-65 from US 80 south of Montgomery to I-85 in Montgomery was without question, the absolute positively worst section of road we have driven anywhere at anytime. I wonder if maybe the road designers that were too incompetent even for Texas and the contractors who were even too bad even for Louisiana got together to build this section of road, ha, ha, ha. (But it could be true.) By mid afternoon we were well into eastern Alabama, once again on US-80 heading towards Columbus GA, all the while slowly winding our way through the wintry southern country side. We were once again reminded of the suffering inflicted on the people in the area devastated by the hurricanes as we saw FEMA trailer after FEMA trailer going towards the New Orleans area. Since we were this far east we decided to push on towards Macon, Georgia. Before the day was over we had traveled 401 miles and were at Twin Oaks RV Park, a neat little RV park just south of Perry, Georgia. This was most definitely not our typical day, but if all days were typical, then all days would be boring! We got to the park early enough that we could just kick back and relax for a while. I'm not sure why we didn't stop and spend time in Alabama as we certainly didn't have to be in Georgia tonight. I did, however, get my "history fix" for the day. US-80 from Selma to Montgomery was the route of the famous civil rights march, so as we would pass by older buildings, I would mentally transport myself back into the 1960's versus the 1860's of the day before. Spent the early evening relaxing and just plain enjoying life, after eating a meal of roast turkey (from the freezer), sweet potatoes and gravy with broccoli. Later Linda baked her, out of this world chocolate chip cookies (she's got baking in the microwave convection oven perfected), which we combined with ice cream to make the perfect end to a perfectly non-typical day. Feb 22 This is the day I get my Civil War fix as we are heading off to Vicksburg to tour the battlefield. The plan was to drive up RT-61, stopping briefly at Port Gibson, then on to Vicksburg. We hoped to leave Vicksburg by 3:30 to avoid the traffic and be able to reach eastern Mississippi before stopping for the night. However, thanks to an email by a reader, we changed our plan to include a drive up the section of the Natchez Trace Parkway from Natchez to Port Gibson. I have always had an abiding love of history and this brief time on the trace allowed me to mentally transport myself back in time to when life was very different from how we live today. There was a certain majesty, bordering on an overwhelming sense of awe, that I got when standing in a section of the old trace, cut deep through the soft Mississippi loess soil. As I peered down the leaf lined trace, the trees, brush and mist seemed to part and I could could see into the past. What a shame it is that to most school kids history is just dry boring facts. As I gazed down the Trace memories from reading Pulitzer Prize winning author, Conrad Richter's The Trees opened a window most people probably never see. Richter's trilogy - The Trees, The Fields and the The Town is absolutely wonderful. To quote from a review, "In this trilogy, Richter weaves a rich tapestry of legend, folklore, and American dialect that captures like nothing else the experience of what life must have been like on the frontier in the late 1700's. Richter won the 1951 Pulitzer Prize for fiction for The Town." While the novels are set in Ohio, it is these people who may have journeyed down to Natchez and walked back along the Trace. Isn't imagination a wonderful thing! Further up the Parkway we stopped at Mount Locust, the only original inn that remains on the Parkway where once again I was transported back in time. We exited the Parkway at Port Gibson and parked along Church Street, which is Rt-61. They have a small visitors center that is on the south side of town, right after we first entered Port Gibson. Unfortunately it will not accommodate RV's. We decided against walking back up to the visitors center and struck out on our own. What a wonderful little old town! Many of the houses and churches have plaques out front that describe the date and architectural style of the structure. This is definitely not the tourist city Natchez is. What it is, is a real slice of America. We spent a long time walking the streets of Port Gibson, again immersed in the past. As we walked along Church Street in Port Gibson Mississippi it slowly dawned on me just exactly why they picked church street for the name of this street. Never have we ever seen so many beautiful old churches (and even a synagogue) in such a small area. No wonder the Yankees called this place "the town to pretty to burn" and spared it as they burned the towns in this area during the Civil War. Think we're done for the day? Think again. Somehow or other we seem to have shifted into high-powered vacation mode. So we turned north on Rt-61 for the second time day, heading towards Vicksburg. To complicate things, rain started to fall, alternating between heavy mist and medium cats & dogs. The battlefield park was easy to reach as the brown NPS signs are both plentiful and easy to follow. It cost us $8.00 to enter the park. There is RV parking at the visitors center ( we chose to leave the coach here and drive the battlefield in the Explorer, but they do permit RV"s on the park roads). We stopped and viewed the visitors center. Didn't impress either one of us. Not sure what I expected, but whatever those expectations might have been, they weren't fulfilled, plus they announced the movie would be shown, then didn't show it. It was a very poorly run visitor center. 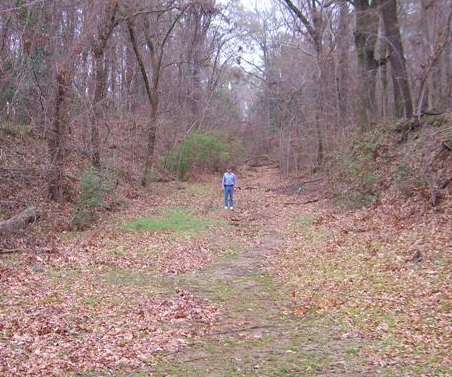 The battlefield drive is very long, first following the Union Army lines, then returning to the visitors center along the Confederate Army lines. One of my ancestors was in an Artillery Battery that was at the battle. We stopped at every marker referencing artillery, but never found one for his unit. However that turned out to not matter. They have something at the mid point of the drive that completely blew my mind. It is a Civil War Gunboat that was recovered from the bottom of the Yazoo River. 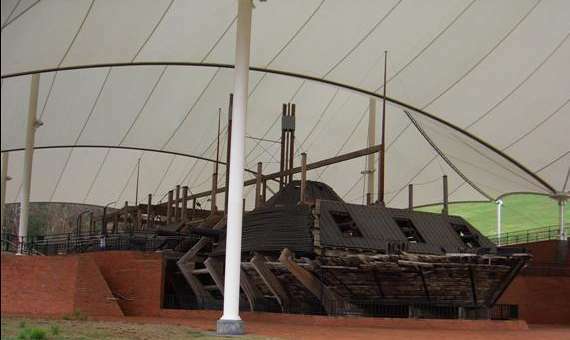 Isn't it interesting how miles and miles of earthworks and dozens of replica canons could not do what the few remaining boards, pieces of metal, armorments and personal affects from a ship that sank with no loss of life could do. For some reason, it made what happened during the Civil War very real to me. I would add that it was the single best display of an artifact I have ever seen in a national park. All together we spent about four hours touring the park, always with a light mist falling. While the off season meant very little traffic, the weather took away some of the enjoyment of our visit to the park. Way, way past the time we wanted to leave Vicksburg we pulled out heading east on I-20. Our goal was to reach the Meridian area and spend the night at a Walmart. If you are going that way, there is a Walmart Supercenter in Pearl Mississippi just east of Jackson which is very easy to find. However, as often happens when we flip the coin and it came up tails at the intersection, we should have ignored it and went the other direction. After getting back on I-20 and heading back west we for a few miles, we drove right to it on our second try. Of course all this took place during rush hour in bumper to bumper traffic. Somehow I have to wonder, if the people that write how their travels are always so fantastic, ever actually travel. We had an interesting and even for us, different dinner tonight. Egg drop dry soup mix which turned out to be perfect for a cold rainy night when accompanied by quesadillas topped with chopped tomatoes, peppers and onions. I kow, here we are in the heart of the south and instead of eating biscuits and gravy, we eat a combination of asian and hispanic food. Maybe this is what they mean by the New South. Later ice cream with chocolate chip cookies topped a great day (the weather might not have been the best today, but the food doesn't get any better that this). Feb 21 Natchez must be one of the prettiest towns in Mississippi but also in America. However, first we had to make sure we had enough energy to tackle the task of walking the streets of old Natchez. One cup of old fashioned rolled oats, an eighth cup of wheat bran, add two cups milk (we use skim) slowly bring to a boil over medium low heat, stirring occasionally. Spoon into two bowls and top with sliced fresh strawberries, chopped walnuts and powdered cinnamon. Now that's a real tasty, nutritious and very healthy breakfast that will see you through a day of Natchez sightseeing! As we had prepared to journey eastward I had done a lot of research on Port Gibson and Grand Gulf Military Park. However, the navigator having decreed we were going to see Natchez, off we were going. First there would be a stop at a lock smith to have RV keys made, then a copy shop stop and last the Post Office to mail in our DirecTV local channel waiver form. Since we only use DirecTV in the coach, we have no "local" stations in the stationary house sense. The local waiver will allow us to receive the ABC, CBS, FOX and NBC stations from both New York and Los Angeles, meaning no more antenna, no more snowy, hissy CSI shows plus possibility to see Desperate Housewives twice on Sunday evening. Linda will be in 7th heaven when we get the waiver!! Of course, no matter what we try to do, there is always something that makes it interesting. How about a locksmith that wasn't, a non-existent copy shop, plus a phantom Post Office. What are the chances that all three places would not be where they were supposed to be? So much for the Yahoo! yellow pages. Undeterred, we stopped at an ACE Hardware store and got all but one of our keys made, noticed a combination print shop/stationary store where Linda got the copies made and also put our mail in their mailbox. When you live on the road you have to either be resourceful or be lost, ha ha. Now we were ready to do some sight seeing in Natchez, but where to go? We drove downtown and stopped at what we thought was the Natchez National Historical Park, but all we found were closed buildings. Finally found the Natchez Visitor Reception Center. Somebody(Trent Lott?) got a big grant from the Federal Govt to build this grandiose edifice. Got to say we really love listening to strong Mississippi accents of the people, though several of them were almost to accented for us non-southerner's to understand. But you know, from the number of times they asked us to repeat what we were saying, I gathered the inability to understand was equal on both sides. Next followed a walking tour of much of old Natchez. The brochure gives just enough info so you can find the old buildings, but very limited info about them. We did find one very cute thing. On the lawn in front of the city building is a stone which memorializes the "city kitty". F ollowing our trek around downtown Natchez we drove out to the National Park Service site at Melrose. 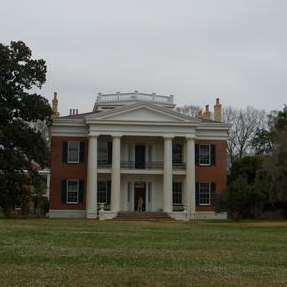 This was an antebellum mansion which we throughly enjoyed touring. Our guide, who's name was Nathan, made the tour extremely interesting. It was more than just a big old house. It was alive with the family that lived there, yet we were also very aware it was the slaves that made this ostentatious lifestyle possible. My take on Natchez: I enjoyed my time there, but am not sure I would go back. To be fair, we were there during the "off" season and it may be if we were to return in the late spring or early fall we would enjoy it a lot more. The real bummer of all this touring was, we had missed lunch. No turkey wraps today, can you believe it? Still, there is always something good that comes from everything. Later Linda more than made up for a day with no turkey wraps by baking those mind blowing chocolate chip cookies, which we ate still warm (and gooey) from the oven. This was washed down with some warm milk to which we added some Torani Irish Cream sugar free syrup. Now that's a dessert, if there ever was one! 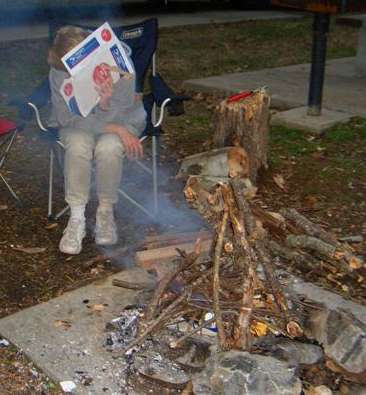 To digress a little bit, after we returned to the campground Linda decided we would have a fire. The area had been receiving rain recently so most of the sticks and wood lying on the ground was wet. Thus a survey of the campground was in order. 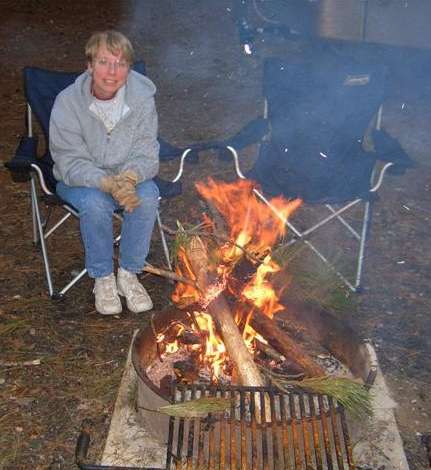 As luck would have it, we located several nice logs in recently vacated campsites and shortly Linda was enjoying her big smoke. Historically, Linda is more likely to build a big smoke than a big fire. For dinner I made some more "pounded pork" which I pan fried this time. It's really very simple, but the result is a pork chop that is elevated a couple of notches on the flavor scale. Start with a very well trimmed boneless pork chop, dust liberally with garlic powder and pound thin with the bottom of a wine bottle (you can use whatever is at hand to do the pounding), then put them into a baggie that has a mixture of chili powder, lime juice, garlic powder and bourbon. To really tenderize the chop, you can prick it repeatedly with a fork prior to pounding it. The more you beat on it, the more tender it will be. You can vary the quantities to your taste and let marinate for an hour or so. 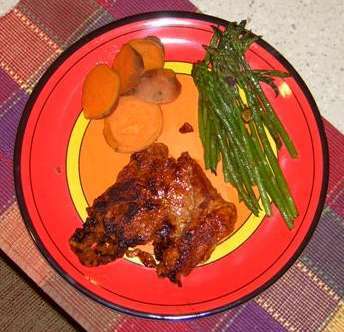 This was pan fried over medium heat in some olive oil and served with boiled sweet potatoes and sauteed asparagus (we like to use olive oil, fresh garlic and just a dash of basalmic vinegar). Accompanied with a tossed salad, it's more than just food! Life is what you make it!!!!!! Feb 20 The reason for stopping here in Orange, Texas was so Bob could visit the waterfront and hopefully see the site where the shipyard that had built the ship his dad served on in WWII had once been. Unfortunately the local ship/shipyard museum was closed. It seems that a rather nasty lady named Rita had come through the area last September which resulted in some rather significant damage to the USS Orleckwhich was moored at the museum. The result is no museum to visit and no info on the local shipyards. Since the only reason we stopped here was to fulfill Bob's need to touch the past, we are sort of up the creek without a paddle (actually at the river without a ship) lol. As the RV'ers saying goes, the next time we're thru this area we will stop and visit the museum. So now what to do? All the weather reports are for colder, rainy weather for the next 5 days. Do we make a dash for Florida, hoping for sun and warmer weather like Linda's sister, or do we take the route we originally had considered, angling up toward Mississippi to the Natchez Trace, then eastward towards the Georgia. Deciding that the Texas coast had given us enough coast living for a while, we opted to face the the possibility of colder weather and visit the central part of Mississippi. What a difference this is from the time before we retired. Then trips like this were vacations of defined duration, preplanned and fully researched. Here we are, five and a half months after our last vacation and maybe the rain can fall, but we can go where ever our heart's lead us (apologies to the late Roy Orbison). Isn't funny how every once in a while the realities of living force us to look directly into the mirror and see what the life is that we really live? Leaving Orange behind, we traveled across the corduroy road that masquerades as I-10 in Louisiana. It did not take many miles of driving in Louisiana before a thought crossed my mind. If there was a state were the traffic design of Texas was combined with the road conditions in Louisiana, the only name for that state would be Impassable. After having read all the stories about how corrupt the politicians and government is in Louisiana, I'd have to say it is either as corrupt as people say or made up of the most unbelievably incompetent people that nature produces. While the foregoing is only my opinion, I invite you to drive on Louisiana highways and form your own opinion. Our drive took us northeast across Louisiana from Lake Charles towards Alexandria, then westward on LA-28 towards the Mississippi River and Natchez. 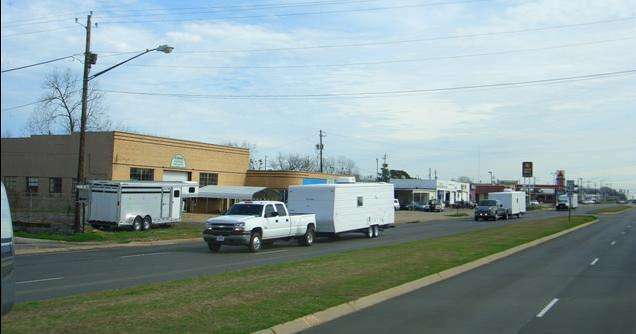 We saw several FEMA Trailer Villages, including a gigantic one just before the Coushatta Casino near Kinder. Brings the reality of the hurricanes face to face with our distorted picture of this colossal tragedy we get from the newscasts. Then the scenery changed. As we got to Forest Hill, Louisiana, wholesale nurseries began to crop up like weeds along Hwy-165 and Hwy-112. It seemed like almost every square foot of land was devoted to growing nursery plants. We weren't to far off as this article shows. We crossed the Mississippi as a large barge passed underneath and Linda took picture after picture so we could put the best one on the website. Unfortunately, all she got were a number of somewhat blurry photo's of bridge girders with part of a barge peeking out. I'd like to figure the odds of never getting a good picture of the barge. We had an interesting journey before arriving at our home for the next several days. Our GPS managed to route us on one of those, never again roads en route to Natchez State Park. We had read good things about the State Parks in Mississippi and we weren't disappointed. A beautiful park, nice level concrete pad, water and 50 amp electric with a nice dump station at the campground entrance is making for a pleasant experience in spite of the dreary weather. While I rate my desire to spend time in Louisiana at about -2 on a scale of 1 to 10, I'd rate Mississippi a solid 8 or 9. We arrived to late in the day to any sight seeing, but did enjoy a relaxing evening the shows on CBS. While the MotoSat finally, after about 2 hours of searching, found the satellite, we can't receive Direct TV for some reason. Talked to the people in the site across from us and they also couldn't find the DirecTV satellite. Small price to pay for the life we live. After a dessert of persimmon cookies and ice cream we called it a very satisfying day. Feb 19 Sunday morning found us on our way back to my cousin's. If you've followed our adventure you know that when we are in an area that has one of the new mega-churches, we like to go and find out what they are like. Turns out the church my cousin attends is an "about to become" mega-church. So we got to enjoy another morning of contemporary music. The man behind the music is Austin Ryan and it was, without question, the best we have heard to date. If your curious, church was Copperfield Community and you can listen to a small clip of their music on the website. Next we went to an early lunch at Pappadeaux. Wow, is the only word I can use to describe the food. I'll just say my Blackened Texas Redfish with crawfish etouffee and dirty rice was simply awesome. Turns out my cousin's husband travels quite a lot on business and he has become almost as good at picking good restaurants as a food critic would be. And the real secret is to not only be able to pick the restaurant, but also pick the right dish, which he has down to a tee!!!! Later, after showing them our coach, their son loved the heated, massaging recliner, laughing about how our slides would be just the thing to get some extra space in their house, we said our goodbye's and prepared to hit the road once again. This just about did me in. Here we were, in Houston, Texas and it was so cold, my fingers would work correctly. And of course, not only did we have to disconnect, but we (I) also had to dump the tanks. 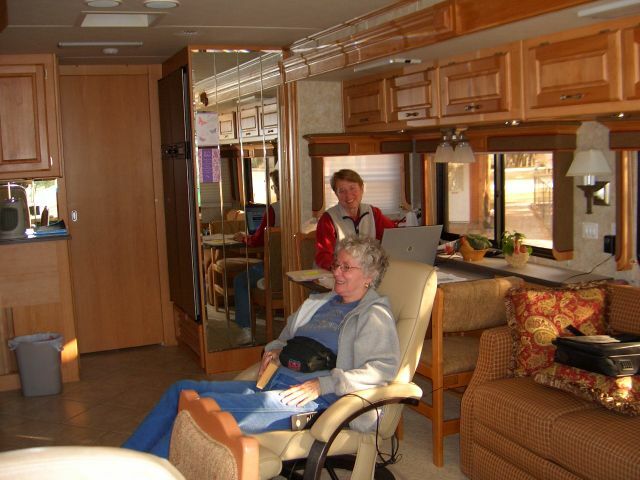 Just remember when you look at all those smiling , happy people in the RV shows and brochures, it ain't always fun and games! Eventually we got it all done and hit the road with the coach heater slowly removing the state of numbness from our bodies. One thing that is interesting is, the cockpit heater in our coach only heats the area right where we sit. Put your hand back behind the seat to grab a map or atlas and it is really cold. Yet where we sit it is warm and comfortable. 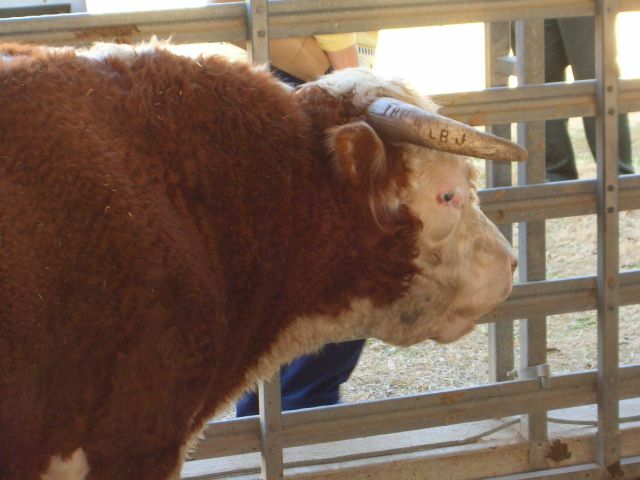 Our route took us on Farm Market Road 1960 to Dayton, Texas where we picked up US-90. We have been trying to take routes that keep us off the interstate highways as much as possible so we see the country rather than just drive from place to place. 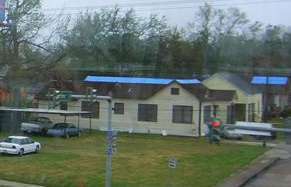 As we approached Beaumont, the blue roofs started appearing and we slowly realized Hurricane Rita had done a tremendous amount of damage to the area. Our plan was to stay overnight just across the border in Louisiana. As a side note, anyone planning to drive I-10 from Beaumont to Orange should aware that when we came through there were construction zones that really narrow down the lanes. It was when we pulled into the Texas Pelican campground that the tremendous personal losses caused by the hurricanes really hit us. The campground was full of people who had been displaced from their homes. Everywhere we looked we saw broken off or uprooted trees, piles of debris and buildings obviously damaged by the winds. For $5 we stayed at the edge of the campground with no hookups. We were glad to contribute even a little bit to the local economy, as it was apparent this area had lost so much. that we have been experiencing over the last month. We had planned to travel east towards Baton Rouge , then north to the Vicksburg area to sate my Civil War history hunger. Following a much more southern line across the south is calling strongly to us. But first we had to run some errands. One was to the post office to mail our grandsons birthday presents, the other was to find a locksmith. With that casual comment you probably sensed a story in the offing. Ever pull into a filling station, put your key into the little door that hides the gas cap and have key break off in the lock? Like, now what do you do? You wouldn't have stopped at the station unless you needed gas, so here you are, no way to get to the filler with the broken key in the lock. What would you do? Now put yourself in our place. Driving a motorhome-car combo you pull into the diesel pump and find the Explorer is only about 3 feet off the road. But you need diesel, so you break the key off in the lock. Now panic because the dealer only gave you one full set of keys and several other keys that were duplicates of a couple of the other keys. First thought is, do we have another gas key immediately followed by the second thought. Even if we have one what good is it with the lock jammed with the broken key. Linda's finger nails to the rescue. She was able to pull the key out just far enough that I could get the tips of my wire cutter pliers on it and pull it out. Cheap brass key, no twist, it just snapped off. There was a duplicate on the other set and it was steel. Hard to get in the lock and hard to turn, but got the door open so we could fuel up. Just another chapter of our adventures in RV'ing. Never did find a locksmith shop that was open, but passing by an H.E.B. grocery store, the Explorer just seemed to turn into the parking lot. Fresh vegetables and ice cream (looks like that wish for a baked dessert isn't going to come true) and some serious chocolate treats for Linda's sister, then we were off to the RV park. Spent the afternoon and late into the evening visiting with my cousin and her absolutely awesome son and wonderful husband. After living in our motorhome for 6 weeks, it was culture shock plus, to be in a house that has a number of rooms which are bigger than out entire RV, but then everything is big in Texas. 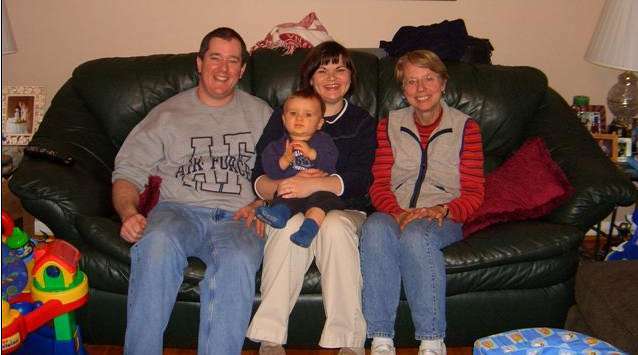 Why is it there is always something so special about being with family? And to top off the evening they even had what is both Linda and my favorite dessert. Tin roof sundae's. Another day of living right! Feb 17 Moving up today. Literally rather than figuratively. The plan is to spend most of Saturday and possibly Sunday with my cousin in north Houston. Now we been driving around in this 38' motorhome pulling our Explorer for over 6 weeks. Throw in a RV driving course and it should be something we can do with ease. Short rewind, throw in driving all the way across Houston and becomes something that is anything but easy. While there may be some that would take umbrage at the following, it occurs to me that it is quite possible that only people that flunked their college course in traffic design are eligible to be hired by the Texas Dept. of transportation. In this city, all common sense seems to have gone out the window when it came to designing the interstate highways. Given all this on my part, I almost blew Linda's mind when I suggested we take I-45 all the through town. It wasn't that I had eaten some strange exotic food for breakfast (the oatmeal cooked with milk and topped with fresh strawberries chopped walnuts and ground cinnamon was awesome), no it it was for very practical reasons I was suggesting it. I-45 was the shortest and quickest way to where we were going. Besides, the traffic reports were showing that it was just congested enough to slow traffic to a reasonable speed, yet not be stop and go. To help identify where the lanes suddenly became exit only lanes either to the right or left (and as I had learned) with no warning, I studied Streets and Trips. This really paid off, as I was in the correct lane at every critical point. The only problem we had was finding the road to the campground. True to Houston traffic design, there was no street sign for Cherry St. in Tomball where we needed to turn. A long, roundabout, traffic filled journey ensued, which culminated, at last, in our arrival at Corral RV Park. This turned out to the nicest RV park we have stayed in to date as we were in the new section. There was time for the girls to do laundry and me to rest before we ate a dinner of chicken in green sauce (tomatilla's, garlic, onion & cilantro) with refried beans, plus my special guacamole. Then it was another night of Olympic masochistic TV viewing followed by the last of the ice cream. Now that was something to look forward to because maybe Linda will bake something for dessert! correcting it, ending up going in the wrong direction for 10 miles (it wasn't easy getting that far off course , but somehow I managed to do it) we finally arrived at the Space Center, thanks to Linda pointing out we didn't really want to go to Texas City. We elected to get the astronaut audio device which was great. If you go I'd highly recommend you get it as it makes the day much more pleasurable. I need to point out we did not have turkey wraps today for lunch. While it would have been nice to have had one at the Space Center, we opted for southwestern chicken wraps, which I would rate okay. But all in all, we all really enjoyed our time there. They have something for every age and every level of interest. We got to see the manned space flight control room when we took the tram tour. 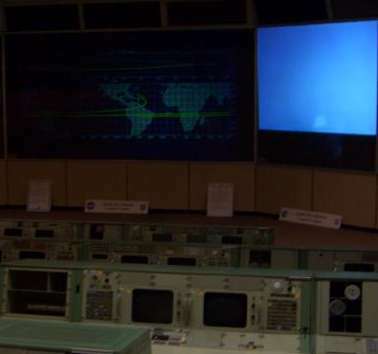 It was the old control room, but the fact it was the room that controlled all the moon flights, the one where the words, "Houston, we have a problem" and also the words, "One small step for man, one giant leap for Mankind" were first heard, meant the world to us. 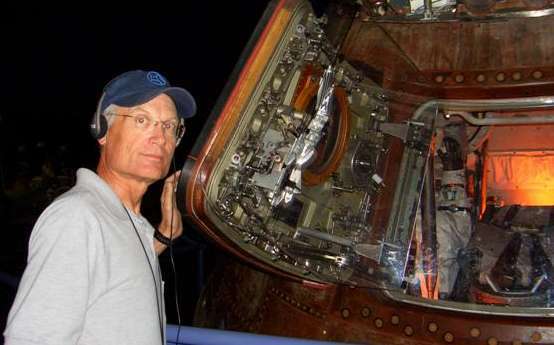 There was an actual Apollo capsule which had returned from a flight to the moon. 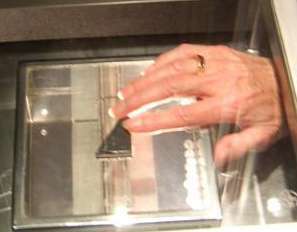 And Linda got her "rock fix" when she got to touch an actual moon rock. 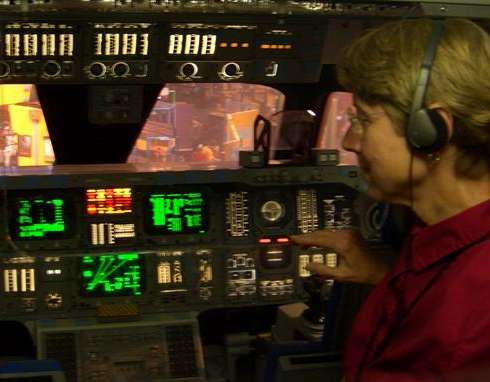 Then later she got be the "commander" of the space shuttle. After a long, full, but very enjoyable day, we headed back to the campground for relaxation and another night of what NBC calls the Olympics. Hey, maybe we're just gluttons for punishment. Dinner was Owens sausage sandwiches, broccoli and salad. Healthy nutrition with great taste. The horseradish sauce on the sausage puts it over the top. Reflecting upon today, in some ways the Space Center was disappointing, in others it was almost beyond words. I'd say, having been there, I wouldn't go back, but I'm glad I went. Dessert was ice cream and 11 O'clock brought a night of peaceful sleep. Feb 15 On to the Houston area is our goal for today. Still not feeling the greatest, but beginning to realize that life on the road is no different than life at home. Good days and not so good days, good health and not so good health, good times and not so good times. This was designated coach cleaning day by the commander, aka, Linda. So after a breakfast of onion, green and orange pepper and garlic saute', which then had eggs poured over it and scrambled, to finally be topped off with grated asiago and Parmesan cheese, out came the dust cloth, sweeper and hand vacuum. The wind had blown everyday we were at Port Aransas. The equation reads: (Fine Sand + Motorhome on Beach) X Constant Wind = Grit Everywhere in Coach. This you either already know or will definitely learn that it ranks right up there with Gravity as one of the immutable Laws of Physics. A corallary to this is: All surfaces will become gritty. Now if it was such an important Law of Physics, why couldn't I remember it from my high school physics class. Guess I'll just chalk it up to not paying attention in class!! As we planned our route over to League City where we would be spending the next several days, we could see there were several options we could take. To make a long story short, if you are planning to stay at Safari RV Park in League City, DO NOT try to take Calder Drive north from 517 to the park. It may look like a short cut on the map, but since Calder dead ends about 500 feet south of the entrance to the park, it will prove to be a much longer route. Now there's always a rest of the story, so, we actually drove the right way, all our maps and mapping programs showed Calder as a thru street. However, no matter how we tried to program our GPS, it would not take Calder from the south, only from the north. Figuring it knew something we didn't, we took its advice and were we ever glad we did! By this time I knew yours truly was catching a cold. So while Linda spent catch up time with her sister, this boy got some much needed rest. Now I did awaken at 4PM when the alarm on my wrist watch went off (my daily reminder that there is still an hour left in the work day - but not for me anymore), but healing sleep called again, in which state I remained until dinner. Chicken Fajitas have never tasted better. Then after an evening of the Olympics or what passes on NBC for the Olympics, aren't there any other countries than America competing? And after listening to all the negative comments by the reporters about virtually every American competitor in what ever event NBC was showing, I realized it made Newton Minnow's comment of long ago, just as true today, "TV is a vast wasteland". So why do I watch? Lest you wonder, dessert was ice cream! Feb 14 This turned out to be a BBD. Here it was, Valentine's day and yours truly had to show one of his BBD's. Sigh. Since we wanted to be in the Houston area to visit Bob's cousin, it was time to leave the sun and surf (also the wind blown fine sand that gets onto and into everything) and see some more of Texas. I get confused whether this is called South Texas, East Texas, the Texas Gulf Coast or just plain Texas, but what ever it is called, there sure is not only a lot of it, but a lot different "its" also. Our travel plans took into account the tide at the ferry crossing, so we would be leaving after lunch. 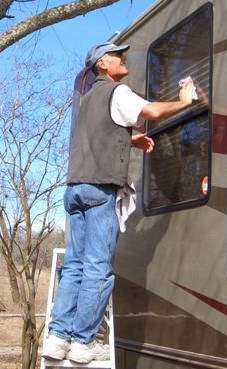 Once again I washed the windows of the coach without using the ladder. I promised myself the last time I wouldn't do it again, and boy o boy, is my memory short! It isn't a problem until the sun finds its way into the exact wrong place in the sky. I did have an excuse, wasn't feeling the best, kind of like a cold coming on. Took some photo's of the campground, then drove up to the ferry landing. Now every time we had been there this week, there were only a few vehicles waiting to board. Not today, took us nearly an hour to make the crossing. Retired, no hurry, no problem. This was not going to be a long travel day as we were planning on stopping in Victoria for the night. Linda's sister had never stopped for the night at a WalMart, so our intention was to initiate her tonight. One spot the ladies wanted to see was Aransas National Wildlife Refuge. The directions read, go x miles through farmland, turn, go x miles through farmland, etc. You finally come out on the coast at which point I had no idea of where we were at as all Linda was giving me was the turns. My body was starting to hurt and though the turkey wrap for lunch had perked me up, life was becoming less fun by the minute. Finally after what seemed like hours we arrived at the visitors center. Of course as we walk up to the counter to do what the ladies want to do, they both suddenly decide to dash into the powder room. By now I really ain't feeling good. Don't really hear anything the attendant says, Linda gets the brochure and off we go. Well, first we have to unhook the Explorer, then off we go. I'm driving down this narrow curvy road, hurting, Nothing from the Ladies so I keep driving After along time I get asked, "aren't we going to stop and see something?" I just keep driving.... asked again, I inform the navigator she has the map and if she wants to stop somewhere, just say so. End up with no stops, get back to the coach, lay down and fall asleep. Later Linda drives the rest of the way to Victoria, and just as we are leaving the park a flock of wild turkeys crosses the road right in front of us. Not bragging, but Linda does a magnificent job driving the coach and it is days just like this that her being able to drive means so much. As she is driving through Victoria, after dark and on city streets no less, I make the bright observation that they sure must like to eat out in this town as all the restaurant parking lots appear to be full. I'll skip all the gory details, but suffice it say that sometime thereafter I was more than fully aware it was Valentine's Day. Like I said in the beginning it was a Bad Bob Day. I guess the only good thing about the day, at least for the Walton's point of view, was not only is there a Walmart Supercenter in Victoria, but right next to the WalMart is a Sam's Club. It would have been much cheaper to have stayed in an RV park and taken the ladies out to dinner. Dessert was a small bowl of ice cream for me (sigh) and off to a, hopefully, healing nights sleep. Feb 13 Today is what I have really come to apprciate about this lifestyle. It's monday, monday as the Mommas and Pappas song goes. Yet it is no different than another day. I know that this week we will be moving again to a new neighborhood, several to be exact, we'll leave the tranquillity of the coast behind and enter into the hustle and bustle of the Houston metro area. But it is our choice to do this. We don't have to drive the same road to the same workplace at the same times for the next five days. When and where we go is up to us. Talking to my son last night, he told me how, he too, wanted to be able to enjoy this type of life someday. Talking with him I remember the many, many nights I spent, eyes glued to the computer, following the adventures of those already living this life. The books I read, the emails, sent and received, thinking, as we saw an RV on the road, do they live in it? And always in my mind was the thought, someday I'll go on my own adventures, following wherever the road leads us. I often remember listening many years ago to a tape where the speaker was, oh so vividly, describing this most marvelous of all places. As I listened, my mind drew word pictures that magically brought that place to life. The enchanting, faraway, yet nearby paradise called, Someday Isle. My dad had an overwhelming desire to visit that place, so many times he'd talk about how someday he would retire, travel, spend endless hours antiquing and visiting with his grandchildren. He almost got to Someday Isle, it was within site, when six months before Dad was to retire, he suffered his second and final heart attack. We all have dreams and aspirations. It was when we realized we were going to have to stop dreaming about going to Someday Isle that we finally understood we really didn't need to have all the material items which we thought we did to make it happen. That we could make it happen with what we had, that you could sail past Someday Isle on either a log or the fanciest ship afloat. The means didn't matter, it was the destination. We're sailing on this big ocean we call, our life, because we can, just as we know you can sail on your own ocean, Because You Can! Feb 12 Just as yesterday morning was chilly, this morning was hot in the coach. Once again we had run the heat pump and portable heater during the night, yet this morning it was 75º when I got up and no, it wasn't mid morning, nor was it any warmer outside than yesterday. Even Linda mentioned that it was warm!!! Someday we'll figure out how these things work. (The heat system and Linda). One of the local attractions that I wanted to see was the WWII aircraft carrier CV16, The Lexington, which is now preserved as a museum in Corpus Christi. While all the tours are self guided, the result was an awesome experience that anyone with the slightest interest in history will really appreciate. While there is a good deal of climbing stairways and going through narrow passageways and hatches, everyone there, from small children to people far older than ourselves was having a grand time. This is by far the best large ship exhibit we have ever visited. I especially enjoyed talking to the very elderly docent, deep down in the engine room. It made real the stories I remembered my dad telling about his days in the engine room of the ship he served on in the Pacific during WWII. He always said he had had enough heat to last a lifetime down there, and boy did he love the cold weather and snow. I can still remember him often waking me at O'dark:30 on a cold, snowy winter morning, saying let's go for a little walk, then shovel snow. Something that as I grew older, I came to appreciate more and more as a very special time in my life. How could I have imagined what wonderful memories a visit like this would spark, deep in the bowels of a warship, built before I was born, talking with a man in his 80's and picturing my dad as a young sailor toiling in almost unbelievable conditions. Being human is such an awesome thing. Because the ship so far exceeded our expectations, our visit lasted most of the day. Please be aware that there is not any free on street parking in the vicinity of the ship. You can park in The Lexington parking lot across the street from the entrance or in any of the Texas State Aquarium lots which are nearby. You have to have a token to exit the lots which you can buy at the ship's admission counters. Cost for the Lex lot is $3.00, while the aquarium lots are $3.50. Of course we had parked in one of the aquarium lots. Later as we returned through Aransas Pass we stopped at the HEB store get some fresh strawberries they had on special according to sign out front. They were even better than advertised and of course once we were in the store we found a number of other food items we just had to have. Who says advertising doesn't work, ha,ha. By the way, for once I didn't have turkey wraps for lunch. I had gotten so deeply, mentally and emotionally involved in walking through the Lexington, I completely forgot to eat. Hey, look at it this way, the only thing I lost was a little weight! While all this was going on, the ladies found a great spot on the flight deck to sit and visit. Spent the rest of the day either talking to family on the phone, watching the Olympics, at least what passes for Olympic coverage on NBC (the lowest common demoninator viewer they shoot for is many, many levels below me) and eating grilled sirloin burgers and chili peppers. We also broke out the bottle of champagne we forgot to get out yesterday on Linda's sisters birthday and toasted the past, present and future. The number of toasts ended up equaling the volume of champagne and we were happy, more ways than one, with that. Since I had eaten the majority of cookies last night, I was informed if I wanted any dessert I'd have to make it. Thus, a little later we we were both enjoying a bowl of hot tapioca pudding. Feb 11 How a few hours can make a huge difference. Last evening the wind was literally howling as our coach rocked and the air was filled with blowing sand. This morning dawned clear crisp and cold, the wind the least of our worries. Both the heat pump and the portable heater worked to keep it comfortable in the coach, barely succeeding this chilly morning. Along with a chilly morning goes a nice hot breakfast to get you going for the day, right? So why did we have cold ceral this morning? Probably the same reason the grocery store always has so many older retired folks in it at 5:30 pm when all the people who work are stopping for a few things on their way home from work, human nature. So continuing to follow in this same vain, we deciced to go grocery shopping. 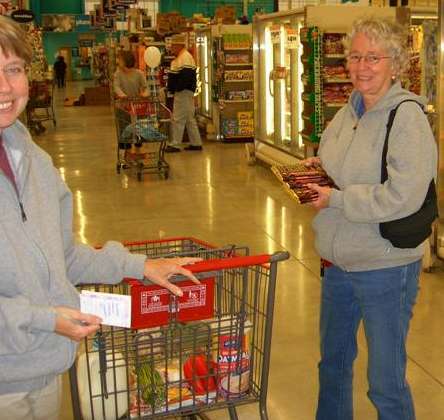 Now another of my former pet observations about life was, why did so many little old ladies do their shopping on Saturday morning, when they could so easily go any weekday morning when there were hardly any shoppers in the store. So here we were, "old" retirees who could shop any morning of the week, going out on Saturday to join all the folks who worked during the week and could only shop on Saturday morning! As the saying goes, "there's no accounting for people". Now when you 'live' in Port Aransas the way we do, there isn't a whole lot of choice in where to shop unless you want to leave town. 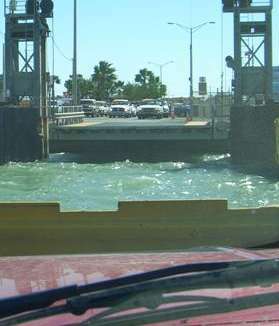 So leave town is what we did, driving down to the ferry landing and going over to Aransas Pass where there is a Walmart Supercenter. My trusty navigator directed me, in her not so unusual fashion, the wrong way through Aransas Pass so we got to also visit the town of Ingleside. Geesh, it's only time and gas, plus the scenery wasn't 'all' that bad. Shopping took most of the morning, who's in a hurry, and we arrived back home just in time to have our usual delicious turkey wraps. In the afternoon we did a little cleaning and decided we would visit another of the "mega churches" while in the area. This time we went to the 5PM Saturday service at Bay Area Fellowship. This one meets in a converted former Elks Lodge and featured some seriously hard rock music along with an inspiring, though very much to the point message, namely, you are responsible for you. This was one of the 8 services they have each weekend and gave us some additional perspective on religion in America. Being normal people, we spent most of the 30 mile drive back to our home in Port Aransas comparing the music at this church, with the music at the others we have visited. This one rated hardest rock and highest volume (but not best sound system). Dinner was once again, grilled marinated shrimp for us , salmon for Linda's sister, Katherine, (shell fish allergy) and grilled sweet potatoes, with brocolli and salad. For dessert there were warm chocolate chip cookies, just baked to celebrate Katherine's ?? birthday (note the duplication of question marks reflecting the type of digits that should be shown, but due to being sensitive to this particular senior citizen, we chose to disguise). This was the first birthday in many many years, actually they determined it was over half of a century, that both had been together to celebrate either of their birthdays. Presents were opened and memories created in a place far removed in both time and distance from the small midwestern farm where they had grown up. Later, Linda made expresso to top off a memorable day. Feb 10 The day dawned gray and misty with cloud encrusted skies as we walked along the beach. A strong, steady wind blew in off the gulf, churning the water into a gray, frothy mass, broken repeatedly with busts o f white as the water tumbled and rolled onto shore or against the jetty walls. It carried the remnants of the sea, casting them ashore. Looking toward the jetty we saw an almost ghostly apparition appear in the distance, one that soon resembled a ship, finally recognizable as a tanker which was being preceded out to sea by a bevy of dolphins. All the while, birds of the sea bounced on the turbulent waters of the shipping channel, intent only on procuring their morning meal. Even though we were silent intruders into this world, who could not be moved by the beauty of it all. These are the things we could not have imagined before we undertook our adventure, but now look forward to, and eagerly seek out when given the opportunity. Returning to the coach we feasted on a breakfast of scrambled eggs with diced canadian bacon, peppers, onion topped with melted cheese. This was accompanied by a toasted English muffin topped with pure fruit spread. Afterwards Bob began working on changing the design of our daily journal, by incorporating the pictures into the text rather than using thumbnails below each days events. This will hopefully make for a more integrated and interesting layout which will also load faster than the previous format. With Bob occupied (Linda terms it "nose buried in the computer, oblivious to anything else"), Linda and her sister went to the laundromat. On the way back they noticed a sign announcing one of the local shrimp boats had just returned, so guess what we're having for dinner tonite? It sure ain't leftover chicken fajitas and refries, no sirree bob!! In the afternoon Bob continued his computer work while the ladies went to visit the local Greyhound track for an afternoon of entertainment. 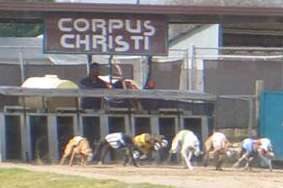 While they did not place any wagers, they still had a great time. Linda's sister had been to the races before, but this was Linda's first experience. It's interesting that Bob's grandfather had a real love for Greyhounds & Greyhound racing and over the years had several retired dogs as family pets. They are truly beautiful animals which were bred for pure speed. While all this was going on, there was a scene that could have been cut from the Hitchcock movie, "The Birds" taking place outside the coach. Bob had felt the usual need for the daily four o'clock shelled peanut snack. Taking bag in hand he went out to the picnic table beside the coach and started shelling and eating the peanuts. After a while he noticed a female grackle had landed on the ground near the table. Without considering the ramifications, he tossed a shelled peanut to her. (The females being brownish and smaller while the males are black, larger and far, far noisier). Within microseconds an entire flock of grackles had descended upon the area immediately around the table. Linda came back a little later and took a picture of the remaining birds by the coach. A little later I confessed up as to how they got attracted to that spot. In the late afternoon the winds picked up, so everyone went over to the beach. The waves were crashing ashore and debris was littering the beach. The combination of the high tide, a full moon and strong winds made for a spectacular show. Linda had the good fortune to find a small, complete sand dollar. 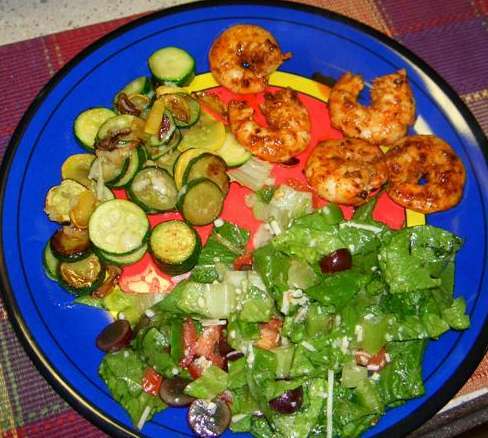 Dinner was the afore mentioned shrimp, pan seared after marinating in oil, lemon juice, garlic and chili powder, accompanied with sauteed squash and tossed salad. Just as we were eating the wind came up so hard we had to bring in the curb slide. All evening long the winds blew and the coach rocked. Checking weatherunderground.com for local Port Aransas stations we found the winds were fairly steady at 25 to 30 mph. Spent the evening watching parts of four different movies on DirecTV (just the good parts of each), then devoured some of that chocolate cake and ice cream I've been raving about, while watching Turner & Hooch, before calling it a very successful day. Feb 9 This morning I was out walking before the sun came up. What a wonderful feeling it is, walking in the gray predawn light, listening to the sounds of the waves lapping up on the beach, the gentle whisper of the wind blown sand as it smooths and refresh the wide expanse between the water and the dunes. At the waters edge the birds sit, as if patiently awaiting the new day. Others ride the waters surface, gently bobbing to the rythym of the waves. Up and down the beach, near the waters edge, stooped over figures are seen, slowly plodding along near the waters edge. Briefly they stop, reach down and lift another shell to their plastic bag, then move down the the beach, eyes fixed on the sand, not seeing the spectacular show mother nature is in the process of displaying for the creatures of the earth. Sunrise has come! 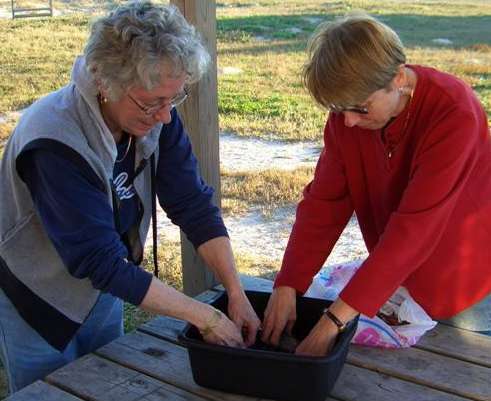 Today Linda and her sister Katherine escaped from Mustang Island and visited the Corpus Christi Botanical Gardens. February caught the gardens between major blooms. 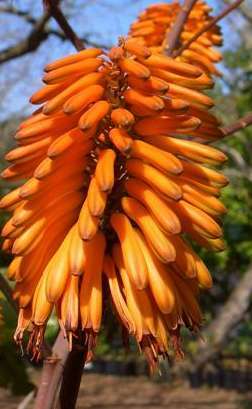 For a number of years we had raised several aloe plants at our house.When we had to treat a small burn, all we would do was cut a leaf, or portion of a leaf off the plant, strip back the outer covering and smear some of the jell on the burn. It was amazing how fast the burn would heal When we were debating what plants to bring from the house as we started our adventure, a small aloe plant was almost included. 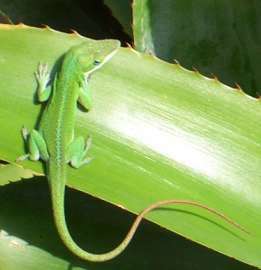 There were many orchids blooming in all their glory, but the highlight was when we spied a small chameleon (we learned later it was a common green anole) but it was fun to watch. While the ladies were out gallivanting around, Bob was back at the RV slaving away (not really, but it looks good in print!!) working on the website, answering email and relaxing. After all we are retired from the life of normal work. All to soon it was time to fix dinner (you'll notice I omitted any reference to lunch, because I didn't have a turkey wrap today). The decision was for grilled, quartered, green peppers slathered in olive oil, turkey burgers, southwestern beans and brocolli. That's what I call eatin' good, others may think it to be a somewhat fowl combination of foods (sorry just couldn't resist the little pun). Later after an evening of Survivor and CSI, it was time for Linda's latest rendition of chocolate cake and ice cream and bed. Feb 8 Lazy day, walk on beach, went grocery shopping. Now that could almost suffice for a complete description of what we did today. However, I've never never been one to merely use a few words, when many more would accomplish the same thing!!! Managed to look outside this morning just as the sun was rising and went down to the beach to take some pictures. Unfortunately I was too late to get the sunrise, but tomorrow will be a different story. Walked out on the jetty, laughed at the pelicans hanging their wings out to dry and marveled at the RV's parked on the beach. Back at the RV, it was a breakfast of oatmeal, blueberries and chopped walnuts topped with cinnamon. Then while Linda and her sister took the dogs for a walk along the beach, yours truly headed inland to explore the town. 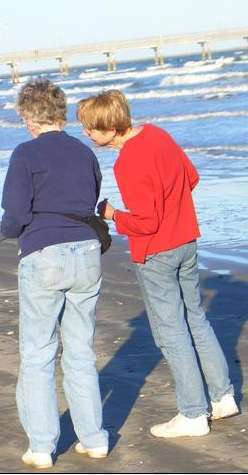 Wow, are there ever a lot of older people out walking the residential streets of Port Aransas. Exploring this way is such fun. Did you know that Duncan Hines, he of cake mix fame, had his honeymoon just up the street from where we're staying. 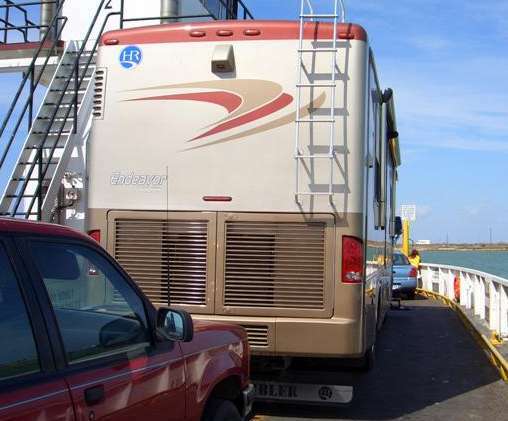 How about the fact the carrying capacity of the Port Aransas - Aransas Pass vehicle ferry is whatever they can load on board. Whole sheepshead sell at the fish market for $.99 per lb while flounder is $3.99. Did you know there is at the very least, either a restaurant or souvenir store on every block around here. All this took the entire morning and soon it was time for the - turkey wraps. To me food is like craps, when you're on a roll don't stop! Now, no smart emails equating the name of the game just mentioned to the wonderful noontime repast we enjoy everyday. It was so relaxing, sitting out under the ramada that we almost forgot that during the preparation of lunch we determined we were in danger of suffering an almost fatal shortage in our food larder. E gads, we are almost out of smoked turkey!! No turkey, no turkey wraps!! Therefore a trip to the local IGA store became a necessity. Approximately 60 minutes and $40 later we returned with a few additional items that Linda felt we needed. 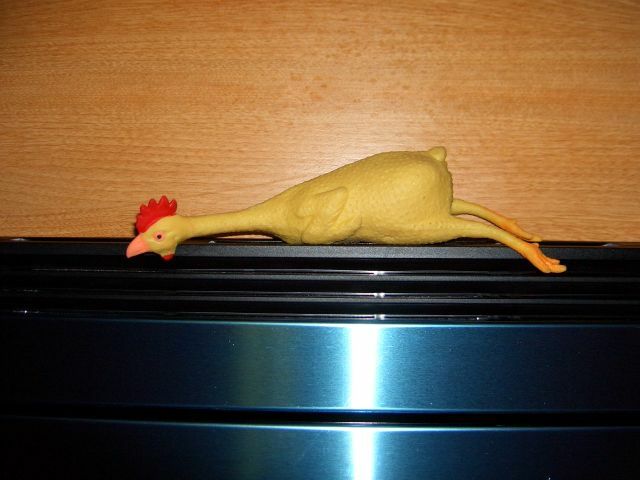 At least we didn't get a rubber chicken like in Johnson City! One of our finds was a package of almost perfectly trimmed boneless pork chops. After being well "forked", followed by a wine bottle pounding, then spending the remainder of the afternoon in a mixture of garlic salt, lime juice, cumin, chili powder, salt, pepper, canola oil and Jim Beam, they were grilled with some portabella mushrooms covered in olive oil, which made for one of the tastiest meals we have had in a long time!!!!! Later we watched a ship sail out the channel, then a new episode of "Lost" while Linda came up with another chocolate dessert recipe that will definitely be a keeper. When we topped it with with ice cream, it made the perfect end to the day. Feb 7 Part of our reason for traveling to Texas was to get in some quality beach time, so bringing in the motorhome slides, we headed down US 181 to the Corpus Christi area. 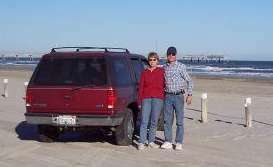 We wanted to stay close to the beach and by using the internet we found a Nueces County Park at Port Aransas on the northern end of Mustang Island which had a Gulf beach campground. This falls under the 'nothing is easy' category. As the Park had recently been renamed, the website didn't show how to get to the campground, the entrance is not well marked and my navigator got all flustered as we drove the narrow streets of the town. The concept of the beach also being a road is somewhat foreign to us inlanders. Anyone who wants to get to the IB Magee Park campground on the paved street, take Beach Street towards the beach, when you're in the dunes look to the left and you'll see the campground. The narrow paved road to the left with the sign that is hard to read really does go into the campground. Don't worry if you miss the turn, just go down to the beach hang a left, go up the beach till you see the entrance station and enter. (Much will remain unwritten about our journey to the campground, lol) Now that we're here, we have several other ways of getting in and out on sand roads. Heck, if camping on the beach is your thing, just drive the RV right out on the beach and park, there's quite a few out there. The campground has water and 30 amp electric and though it does not have sewer hookups, it has several dump stations. The campground is protected from the blowing sand by the dunes, yet is only a couple hundred feet from the beach on the Gulf of Mexico. We decided it was nice enough that we would stay for a week even though there is supposed to be cooler weather coming this weekend. Spent the rest of the day, after eating a very late lunch of turkey wraps, kicking back at the beach, picking up shells and just enjoying life. Dinner was my perfect chicken fajitas, eaten while watching NCIS, which turned out to be a cut up bodies episode. Those fajitas were so good and so was Abby!!! (We call watching NCIS - getting our Abby fix). Later it was a Linda modified recipe of chocolate brownies made with vanilla pudding instead of the chocolate pudding the recipe called for that finished off the day. That woman, who just happens to be my wife, has a nack for making good food, great! Feb 6 Lest you think we have become vacationer's, rather than eager, young, respectable retiree's, let me assure you we have most certainly not! This morning we dug out the step ladder and buckets from the bays under the motorhome, so we (Bob), could wash the outside windows of the coach. This was a job that (we) had been putting off since Quartzsite and Linda decided that it was going to get done today, so Bob did as ordered, err, requested. While Bob washed the windows on the coach, Linda's sister washed her entire van. Whereupon Linda was heard wondering out loud why Bob didn't wash the coach as well as the windows. Who can ever understand women? Later after a wonderful lunch of turkey wraps, we drove over to San Antonio Missions National Historical Park, which is comprised of four missions dating from the 1700's. 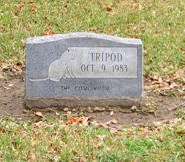 This trip was suggested by the owner of the campground we were staying at as the number three place to visit after the Alamo & Riverwalk. We chose to visit Mission San Jose, where the Park visitor center is located. Arriving at the right time, we were able to attend a Ranger led tour of the mission that was quite informative. The history of the missions is fascinating and one can only try to image what life was like as the old ways the Indians knew were replaced by the new ways which were so foreign to them. As an example, the missionaries not only had to show them how to build the buildings, they also had to teach them the meaning of time and that you were expected to do the same things at the same time each day. It begs the question whether their life was better before or after the missionaries arrived. 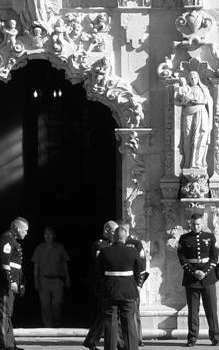 There was a very poignant moment during the tour, when, as we were sitting in the Church, the Honor Guard came to prepare for a funeral service which would be held the next morning for Sgt Sean H Miles of the United States Marine Corps, who had been killed in action in Iraq on Jan 24th. 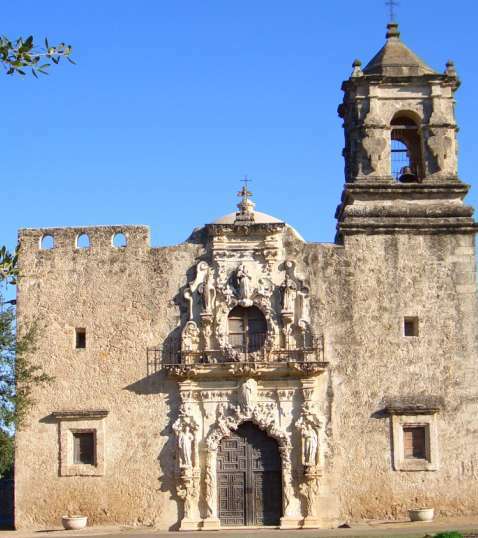 The San Jose Mission grounds also give you an excellent idea of what the Alamo must have looked like in the early 1800's, which is not at all how it looks today, since the Alamo is right in the very heart of downtown San Antonio and nearly all of the outer grounds are gone. Instead of wide expanses enclosed by walls, they are now city streets and a retail center across the street from the Alamo. One can view it either as disappointing that all the development was allowed to encroach upon the Alamo (there is a very fascinating story to the history of the Alamo in the years after the battle) or we can view it as wondrous that out of such tragedy came the magnificence that is the Texas of today. 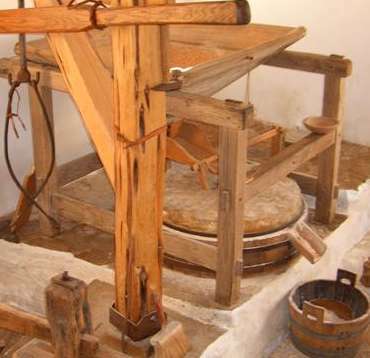 Later we visited the mission's working grist mill, which on the same site as the original mill. The docent was a VIP (Volunteer In Pa rks) from Michigan and besides learning about the operation of the grist mill, we enjoyed finding out more about how the volunteer program works, which is something we want to do in the future. Her husband had taken early retirement at the first of the year (sound familiar) and this was their first VIP experience. 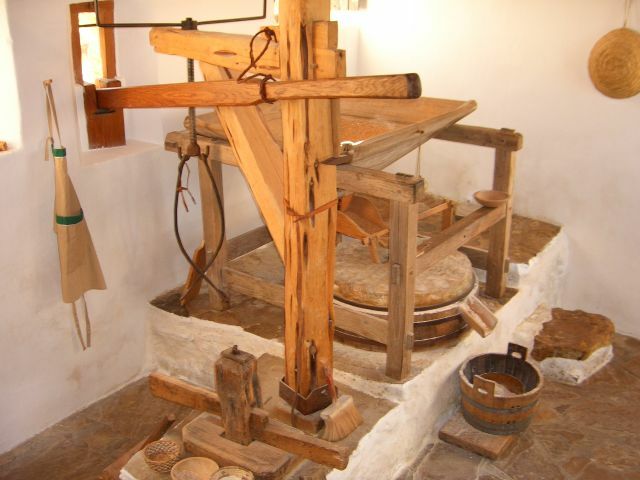 She operated the grist mill while her husband was the roving docent on the grounds of the mission. They worked 24 hours a week and were staying at an abondoned Air Force base about 7 miles away. 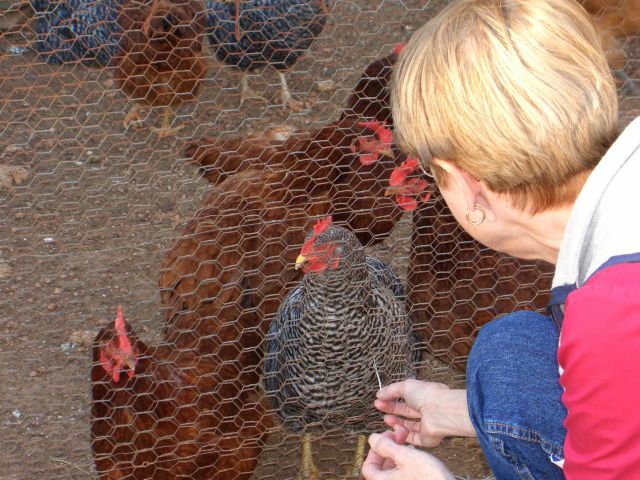 Other than the accomodations, they were loving every minute of the experience. After their three month commitment to Mission San Jose was fulfilled, they would be spending the summer as volunteers in a park in the upper midwest. There are so many ways to live life on the road, there isn't enough time do all the things we want to! For dinner we polished off the last of the leftover spaghetti with sausage sauce, which was followed by brownies and ice cream. I'll tell you, we sure do eat good!!! Feb 5 Moving day today, so we packed up the house and drove from Johnson City to San Antonio. 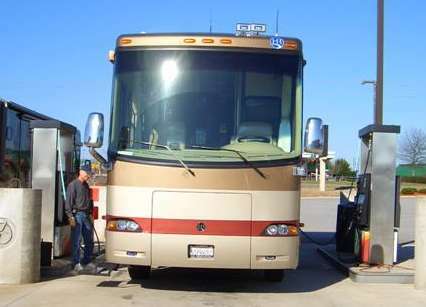 Of course nothing is ever as easy as you think it's going to be, particularly when you combine a large RV and novice travelers with a big city then throw in the old closed freeway in the downtown area due to construction monkey wrench. All this equates to a fun filled?? trip, though it was by dint of a major change in plans due to said freeway closure when we were in exactly the wrong lane to go where we wanted. The fact is that regardless of the route, eventually we arrived at our destination. 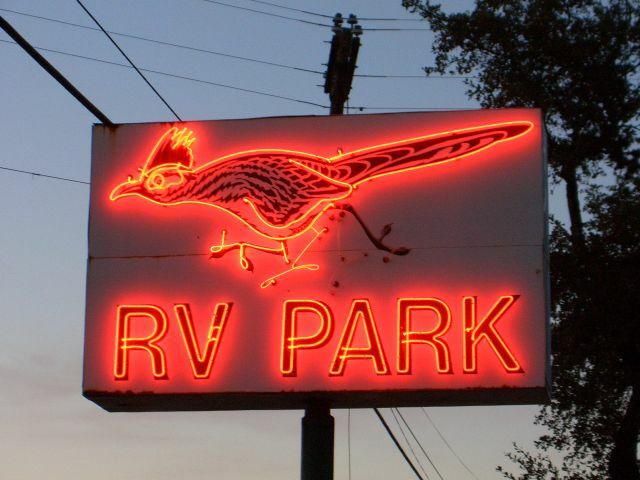 Now the choice of a RV Park or campground is always a personal thing and RV'ers certainly have widely differing opinions as to the type of facility they prefer. To preface the discussion on our choice for this segment of our adventure, we had thought about joining the discount camping program, Passport America program before we set out on our adventure, but had held off. 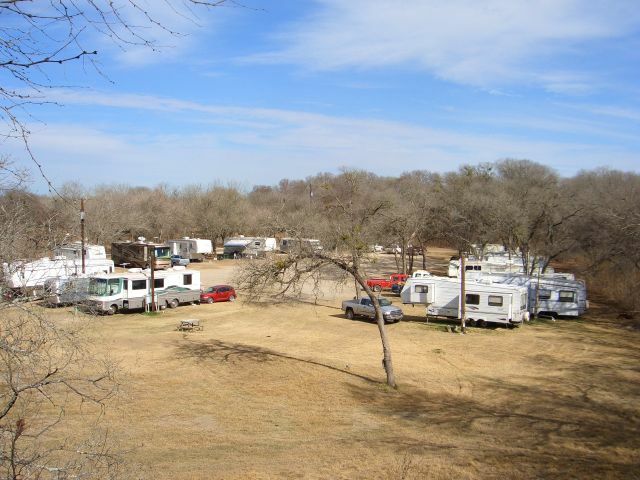 So, looking for a campground that was reasonably close to San Antonio as well as reasonably priced, we selected Hidden Valley RV Park near I-35 & I-410. What we found was a secluded little campground in a small valley with with full hookups, including 50 amp electric. Since this was a Passport America park, we decided to join and stay a couple of days for the discounted rate of $9 per night. Now we will only have to stay at Passport America parks a few more nights and we're back even in the money department. A situation Linda will make sure we accomplish and then some. The road coming into the campground was gravel, rough and dusty, the sites, situated close together were mostly all back-in except for about 6 pull thru's. 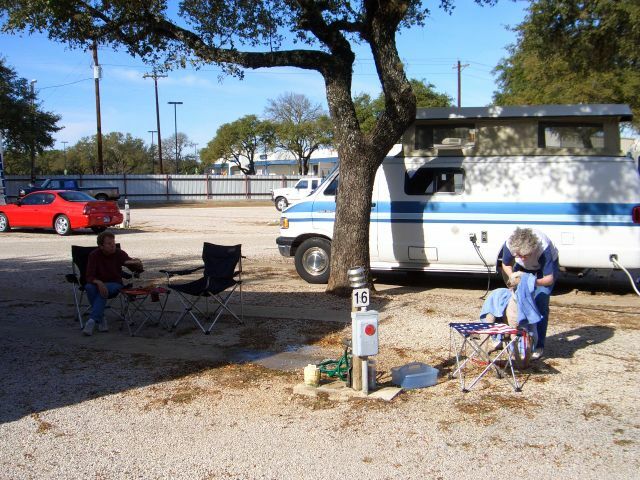 With were no other facilities (no restrooms) and a fair number of long term or permanents it is definitely not a "Resort" RV park, but more than adequate for our needs. The owner was just an absolute jewel and she made us feel like we were special. 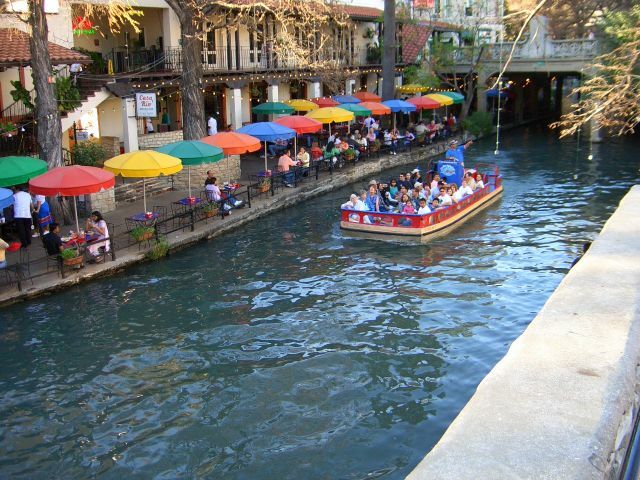 After getting set up, which consisted of hooking up the electric and locking the door, we were off to the Alamo and the Riverwalk, though my to co-travels only thought we were going to the Alamo as they knew nothing about the Riverwalk. Since it was a Sunday afternoon, traffic was light getting into downtown, and with only a few misdirections from my trusty navigator we soon found ourselves going in the wrong direction. 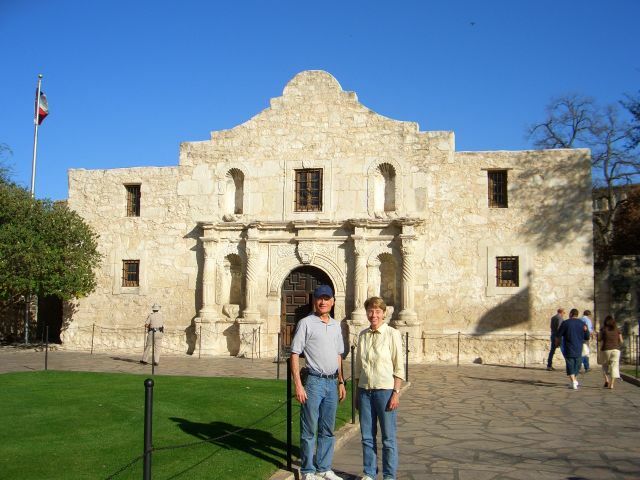 Eventually we did find the Alamo and parked nearby. Interesting that the weekend parking rates are higher than the weekday rates. There are a number of docents, and presentations about the entire history of the Alamo, all of which we tried to be part of. Made the Davey Crockett of my childhood real to see a book inscribed by David Crockett and also to see one of David Crockett's own rifle. I should point out that we were able to do all this touristing because we had fortified ourselves on turkey wraps before leaving the campground. Next we walked across the Alamo Plaza and down to the Riverwalk. After walking a ways and saying over and over, this can't be in the middle of a city, we came upon the tour boat station. The people in the boats we had seen while walking looked like they were having a great time, so we got our tickets and had a great time also. Turns out the boat captains get most of their income from tips so they work really hard at making the cruise a great experience, ours sure was! Later as the sun set we dined on enchilada's, quesadilla's and a gringo burger (Linda's sister doesn't do Mexican food due to allergies) while sitting at a table at the edge of the river. The ladies did make sure to do a Margarita while Bob had sweet tea (didn't even taste like tea). 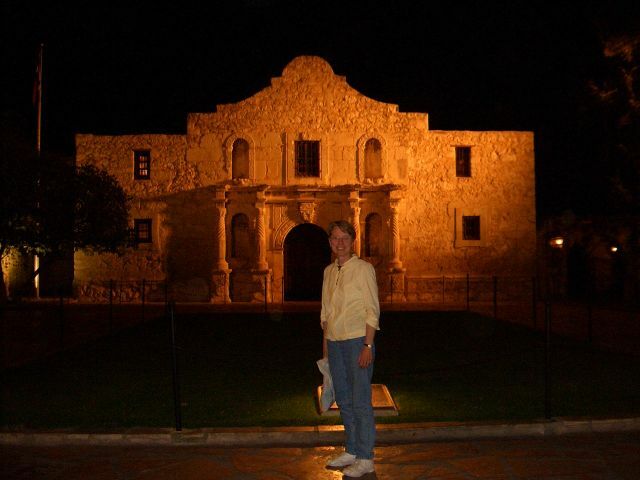 Returned to the Alamo, not realizing it was unbelievably beautiful after dark. Then back to the campground for Ice cream dessert and the end to a fabulous day. Feb 4 When we lived our former life, Saturday morning always meant laundry if we were home. Also there is this fond remembrance of the "old days" as "goodold days", so took the dirty clothes out of our Splendide 2100 washer/dryer, put about 1/2 back in and washed them. To things about our washer/dryer: 1. it serves as our dirty clothes hamper between laundry days 2: it is the greatest thing to make life easy. Linda still occasionally uses the RV park laundry facilities. At this campground the OoO sign, (Out of Order sign) was prominently displayed as we've seen several times in our short time traveling, thus making the W/D just the appliance to have. Back when we were working up our must have list for the RV, two things that kept coming up over and over were the 4 door refrigerator/freezer and the washer/dryer, both of which we have already come to treasure. One of the beauties of our W/D is we can go off and leave while it is running and not be chained to the laundry facility. This is exactly what we did, visiting the LBJ Ranch complex out of town. There were several surprises on this trip. The ranch is a National Park you tour by bus. 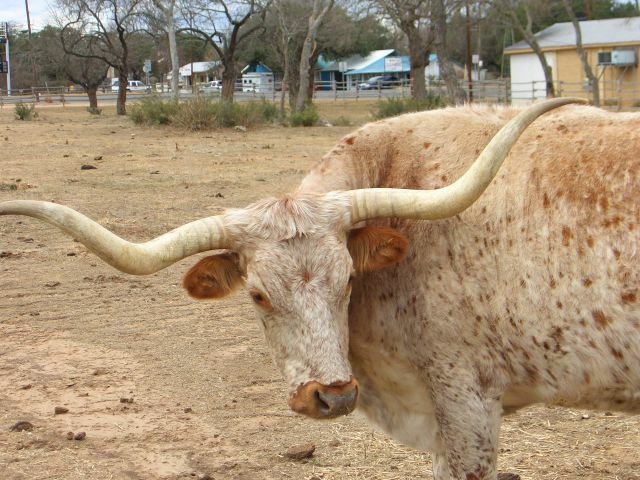 At the same location there is a wonderful State Park complex that is dedicated to preserving the Texas Hill Country. 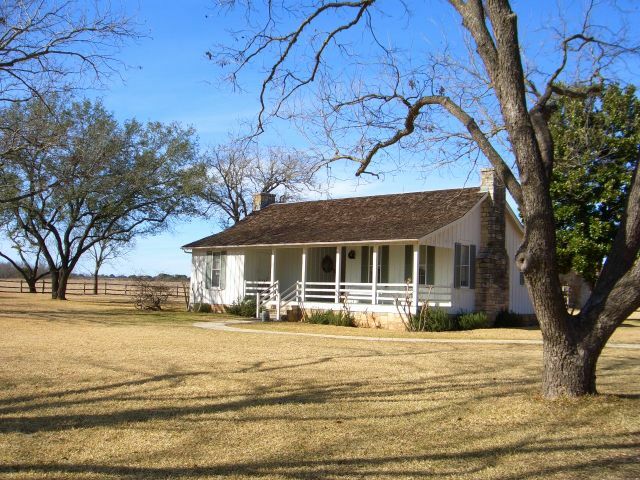 The LBJ Ranch was donated by the family to the National Park Service, with the President and Mrs. Johnson retaining lifetime rights. Therefore you can not tour or even get off the bus at the ranch house. Mrs. Johnson still spends some weekends here, though she now lives in Austin, as does her daughter Lucy. Did get to get off the bus at the recreated LBJ birthplace on the farm and also the family cemetery where numerous ancestors as well as the President are interred. The NPS Ranger made the visit very enjoyable. He was a native from the area and had many interesting stories and tidbits of information about the family and the area. 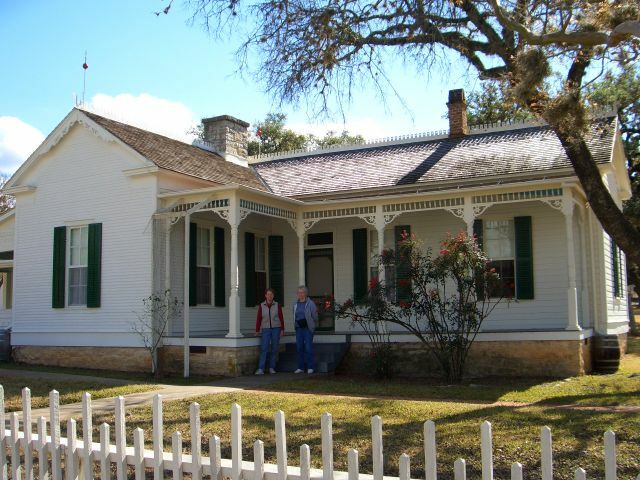 As part of the LBJ State Park, which is separate from the National Park, is the Sauer- Beckmann Living History Farm, which recreates Texas Hill country Farm Life in the early 1900's. If you have even the faintest interest in how people lived a hundred years ago, this is an absolute must see. Feb 3 Anyone remember the song: Turn Down Day by The Cyrkle, that's what it was for us today. Just a slow, lazy day with an enchanting visit to the Johnson City District of the Lyndon B Johnson National historical park that made for an awsesome, yet contemplative experience. All my life I've detested this man for lying to the American People about the War in Vietnam. One result of that lie was the death of my brother over there. Life has so many what if's, that's why, when you see opportunity grab for it with all your strength and willpower. Yet this man did so many good things also, that it makes a rational judgement of him difficult for me, as it no doubt is for many others. The visit was good because because it showed that he was no different than anyone else. Just a human being trying to do, based on his background, morals and the times, the best he could. Enough of that! He was obviously a large man. They have his famous rocking chair on display, think I'd almost get lost sitting in it. Also learned the town is named after a cousin of his grandfather. In the Johnson settlement area is the cabin his grandfather and grandmother lived in 1867. 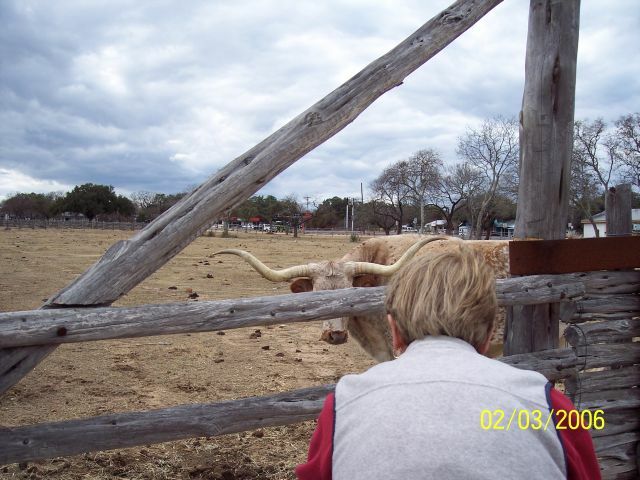 As part of the settlement there are several fields with longhorn cattle which fascinated Linda. This whole area is within a mile of the campground and is an easy walk, though we chose to drive. Later drove around in Johnson City, a small town that obviously has seen far more prosperous days in the past. After relaxing in the coach, we followed our lunch of turkey wraps with a dinner of spaghetti with sausage sauce and salad. Later we went to the little strip plaza next to the campground where Linda found a rubber chicken that is now proudly displayed above our microwave. Dessert was the last of the Warm Chocolate Cake and pecan ice cream. Can't wait to taste what she bakes tomorrow! Feb 2 Got up this morning and found the neighborhood around the Pecos WalMart had definitely improved during the night, parked behind us was a Prevost with MotoSat! Unfortunately we needed to hit the road to meet up with Linda's sister in Johnson City, so didn't get to visit with them. 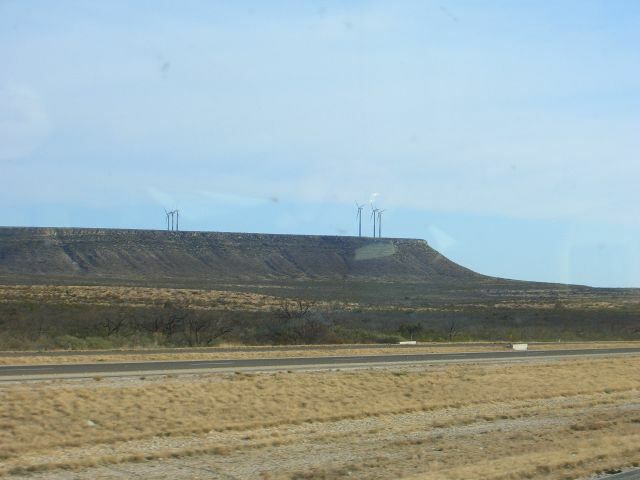 Leaving Pecos, we drove southeast (morning sun in the eyes) to Fort Stockton and fueled up at a Shamrock station across from there WalMart with easy acess, high speed pumps and good prices. Now it was time for traveling due east to Johnson City. 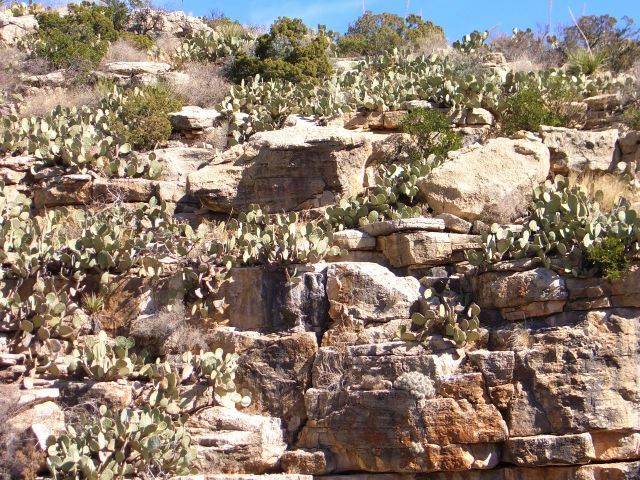 After driving for miles thru intermittent limestone road cuts (which block the constant winds), just east of Ozona Texas a minor miracle occured. We started seeing trees along the road. Not just the occasional tree along a creek or river like we had been seeing for the last 3 weeks, but honest to goodness real trees. The closer we got to Johnson City, the prettier the country became. It is easy to understand why LBJ loved to return to his ranch so often. 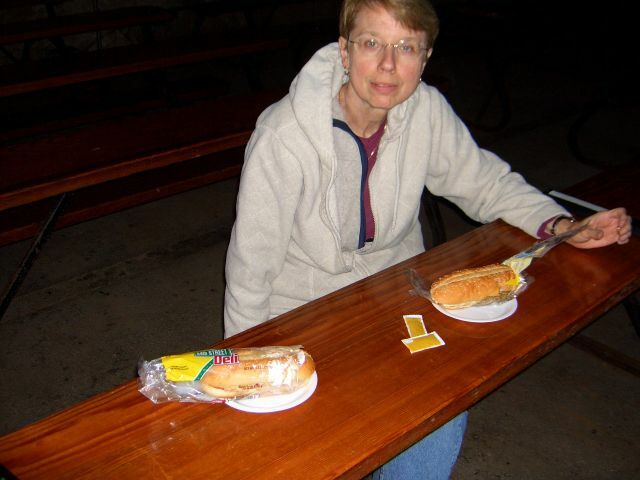 Our plan was to meet Linda's sister at Roadrunner RV park, just south of Johnson City which we found out was an old park with very narrow roads and sites. If you read between those lines, then you guessed I managed to just barely scrape an inch of paint off the coach when pulling into the site. It really isn't noticable, being at the very bottom edge of a compartment,just before the right rear tire. Still, I flogged myself for not paying enough attention to what I was doing. This is really small town USA around here, yet as we were left I-10 and drove east on US 290 toward Johnson City I was thinking, why would there be a four lane highway out here in the middle of nowhere with very little traffic on it? Finally the light bulb lit up very brightly. Lyndon Baines Johnson! Powerful congressman, more powerful Senator, Vice President and President!!! Why not a little "pork barrel spending" for the folks back home. Local people see and use the road everyday then remember who got it for them come election day. No, I'm not a cynical old man, just pragmatic. After a dinner of chicken in wine sauce, another fabulous South Beach recipe, the girls visited and I tried to get caught up on email. Later we watched CSI (almost missed it since we now in the Central time Zone and everthing is on an hour early) then had the same awesome dessert we so enjoyed the night before,the Warm Chocolate Cake recipe Linda modified which she topped with pecan ice cream. Man-o-man I can't believe it's actually good for you, but it is!! I'll eat to that!!!!!. Feb 1 Up early and after a quick breakfast of cereal and milk, it was up a very curvy US 82 to Cloudcroft, then on to Carlsbad. Got fooled on this route. The map shows it to be a fairly straight road. Not so. The worst part was we were driving into the sun, so it was very hard to see the road. There was even a tunnel that we navigated with ease. Once up on top it was gentle rolling scrub land. For the last couple of days the same thought keeps hitting me, "There sure is a lot of nothing out here" and how true it is. Our route took us south of Roswell and though we looked and looked, we couldn't indentify any alien life forms, bummer. 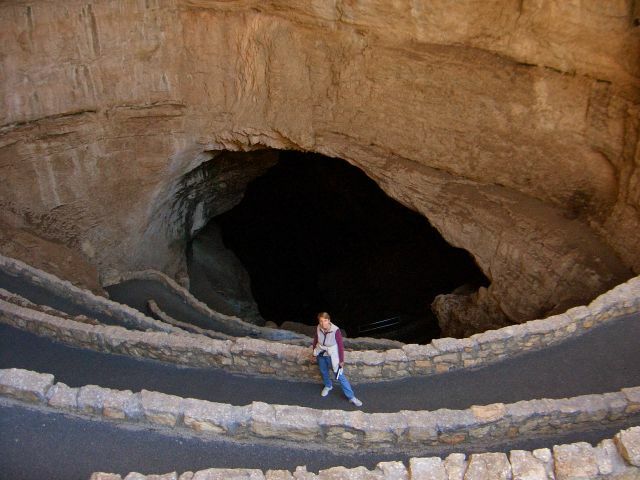 We arrived in Carlsbad about 11AM and immediately drove out to Carlsbad Caverns and did two really good things. First we got the hand held audio guide for each of us and second we signed up for the Kings Place tour. 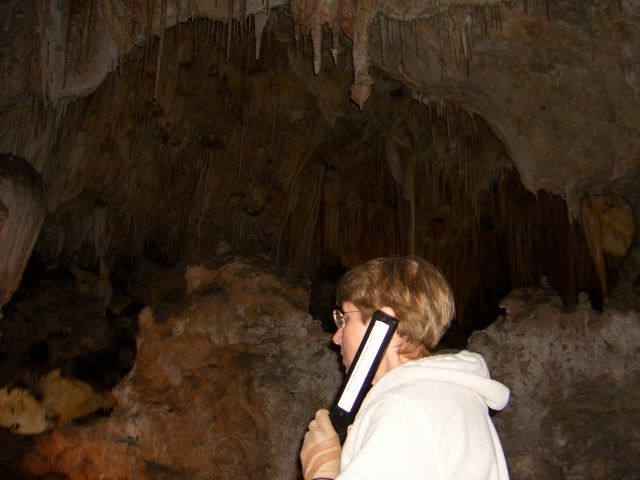 We both would highly recommend doing these two things when visiting the Caverns. The Caverns have always been one of my dream locations. 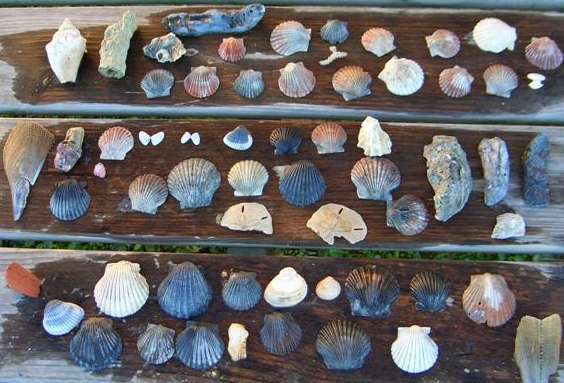 The Outer Banks of North Carolina was another and I found it to be a disappointment. 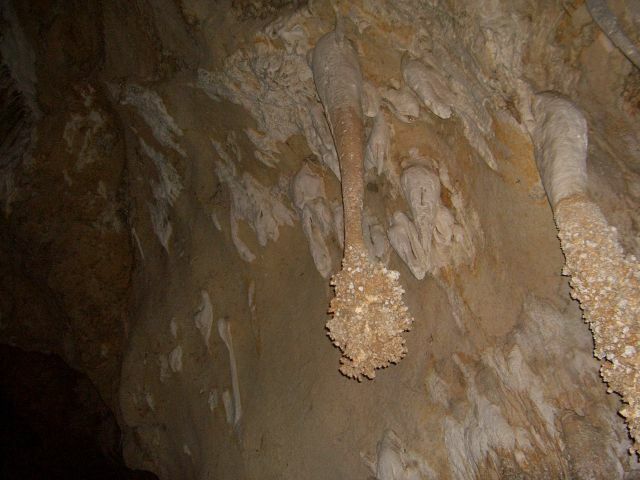 Not so, however with Carlsbad Caverns. They actually exceeded my dreams. There is no way that pictures or movies could begin to do justice to the either the enormity or the beauty of the Caverns. They are so awesome they seem almost fake like a movie set. This warm February day was perfect for a visit as there were very few people at the Caverns today. Since we had plenty of time and our audio guides we elected to walk down the original entrance. We didn't get to see any bats as they are there in March thru October, but at times there is this unforgetable odor wafting in the air. Hint- thousands and thousands of bats make thousands and thousands of piles of bat poo, aka bat guano. Later we had the priviledge of being on Ranger Jason Richards last tour. 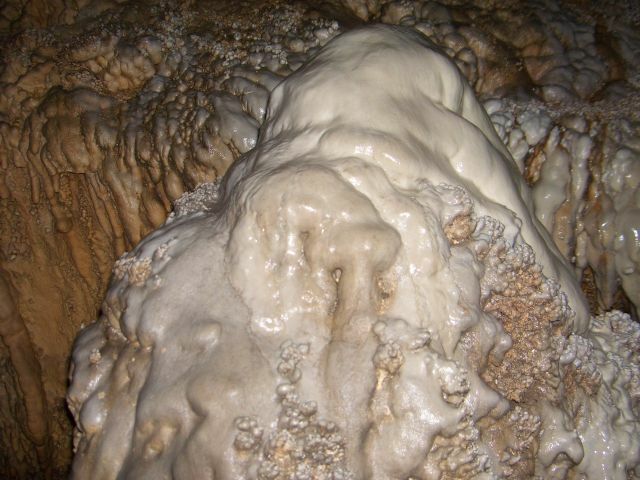 He had started out as a cave specialist many years ago and had so many wonderful stories to tell. Now all this touring took a long time and we found ourselves in the Cavern at lunch time, so no turkey wraps today! Posted a pix below of our honey mustard chicken sandwiches. In the late afternoon we made a 70 mph dash for Pecos and made it just as the sun was setting. Found the WalMart and shopped as usual, found a Best of Gallagher, full Sledge-o-Matic version on sale plus the usual foodstuffs. Dinner was pan fried sirloin bugers smothered in onoins. Later I finally figured out how to use the new US Robotics USB wireless port on the desktop while Linda baked a new recipe from the South Beach Diet for Beginners website, called "Warm Chocolate Cake", a must repeat dessert, especially when topped with pecan ice cream.